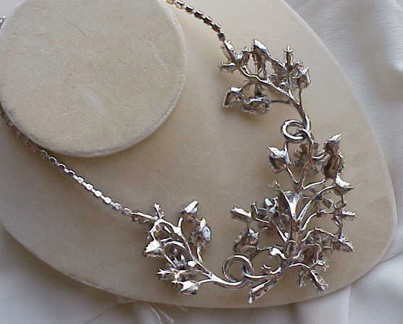 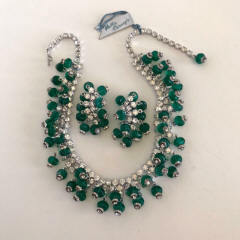 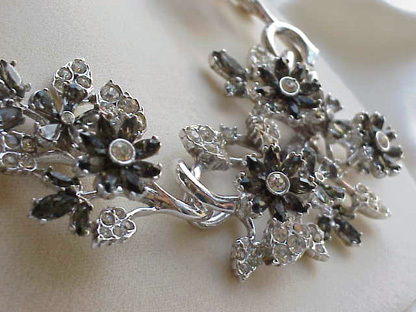 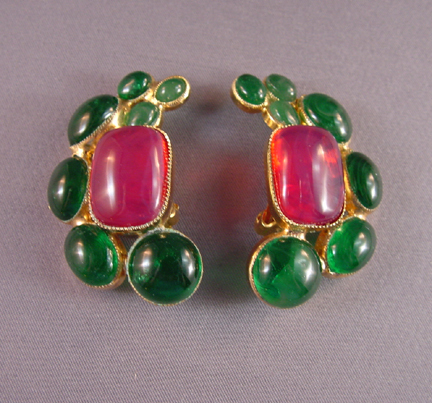 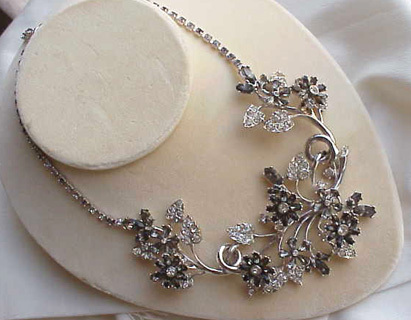 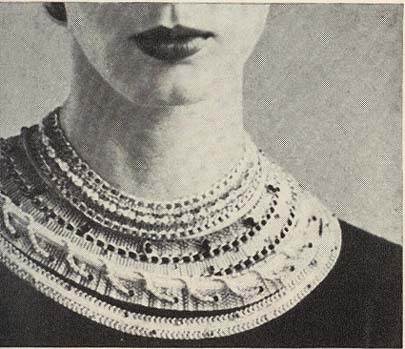 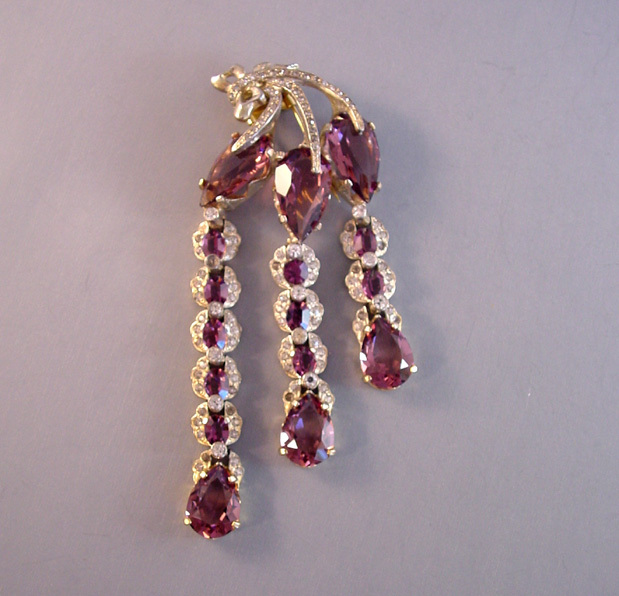 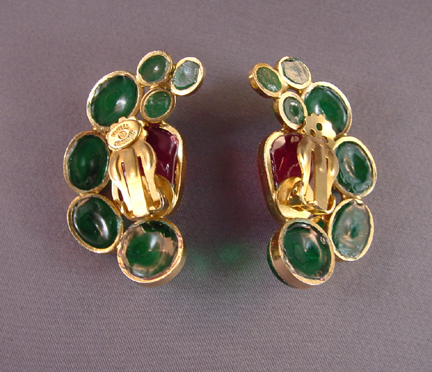 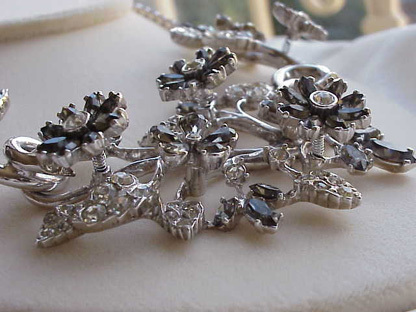 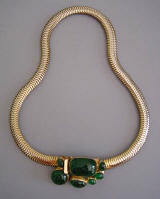 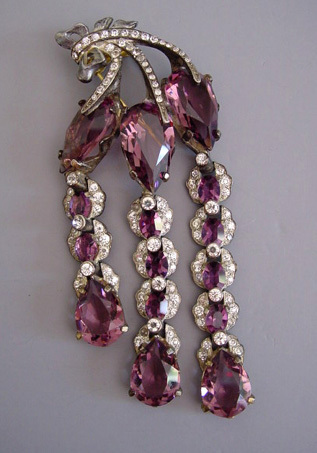 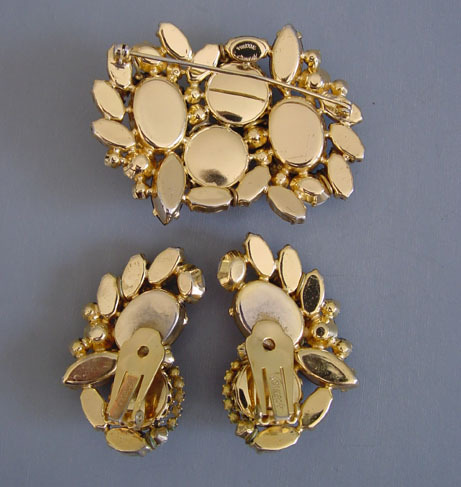 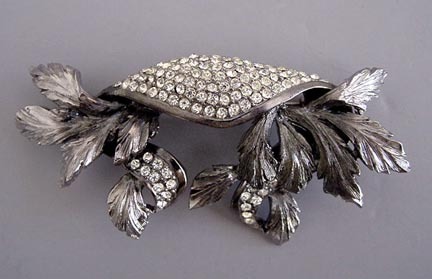 Carnegie costume jewelry was made from the 1939 to the 1979. 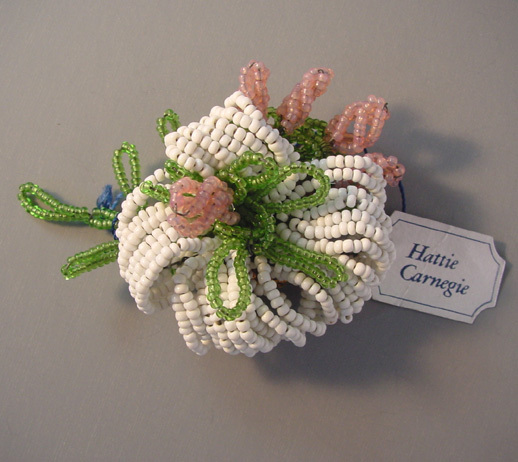 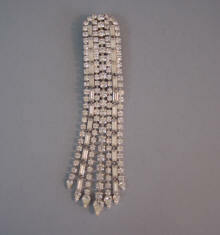 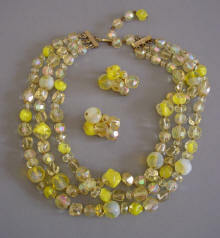 HATTIE CARNEGIE was the creator of a fashion empire designing not only clothing and accessories but jewelry as well. 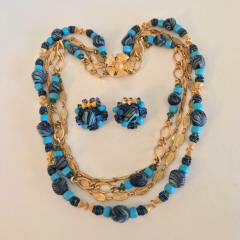 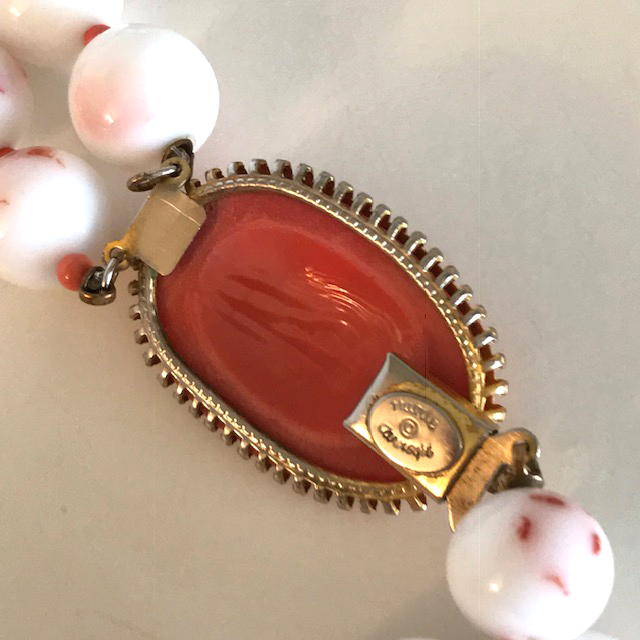 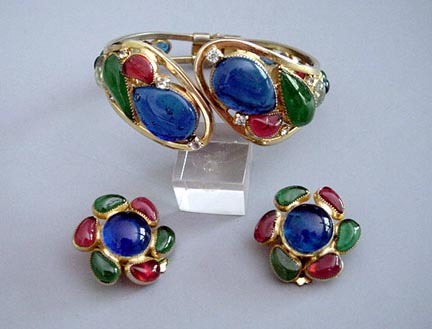 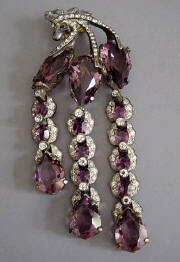 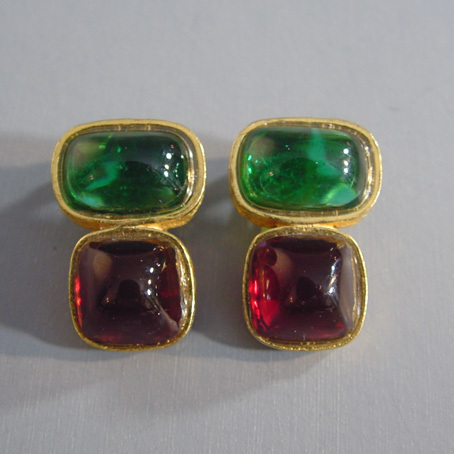 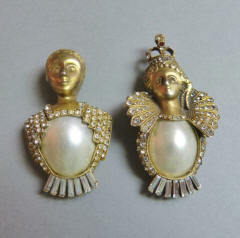 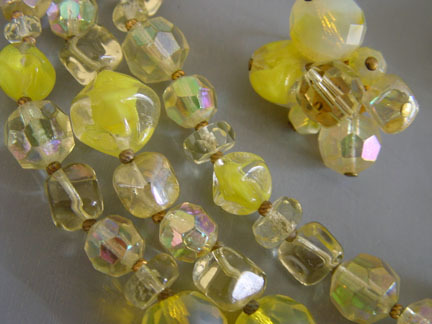 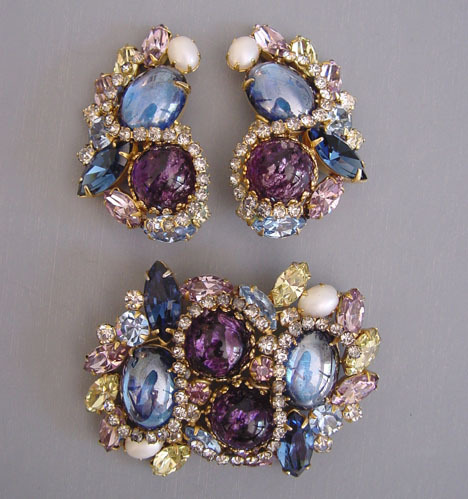 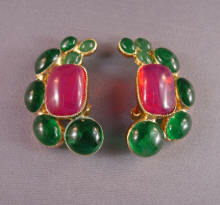 Carnegie costume jewelry was made from the 1940's to the 1970's. 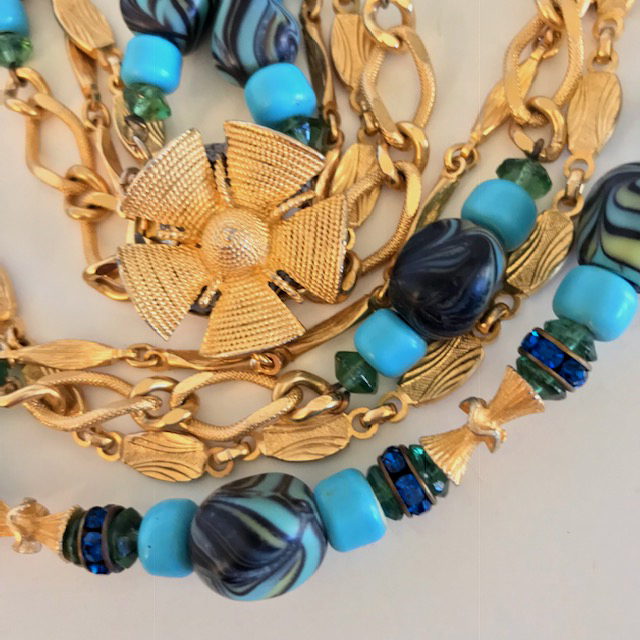 She often used specific themes in her jewelry lines, an example being her Oriental group, her beaded flowers and her poured glass pieces. 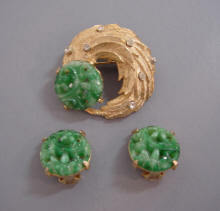 Some of her major designers were Norman Norell, Pauline Trigere, Peggy Moonan, Nandine Effront. 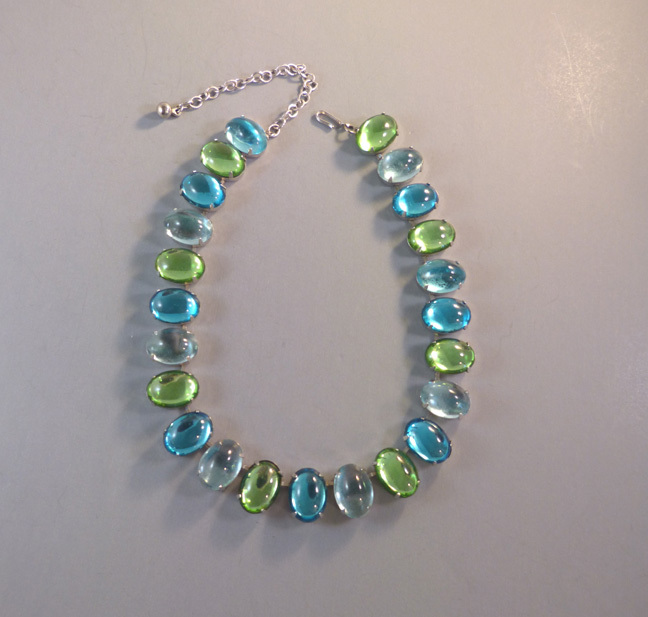 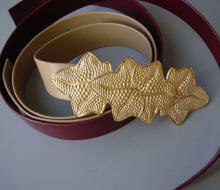 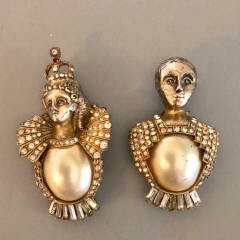 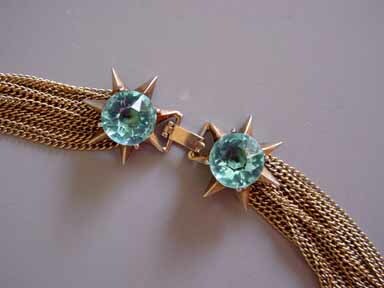 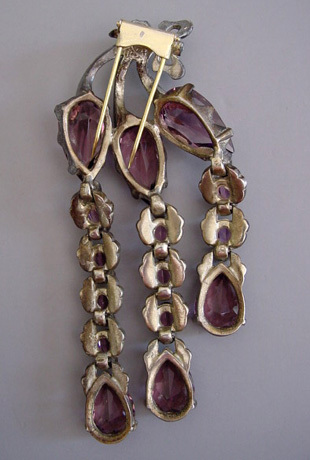 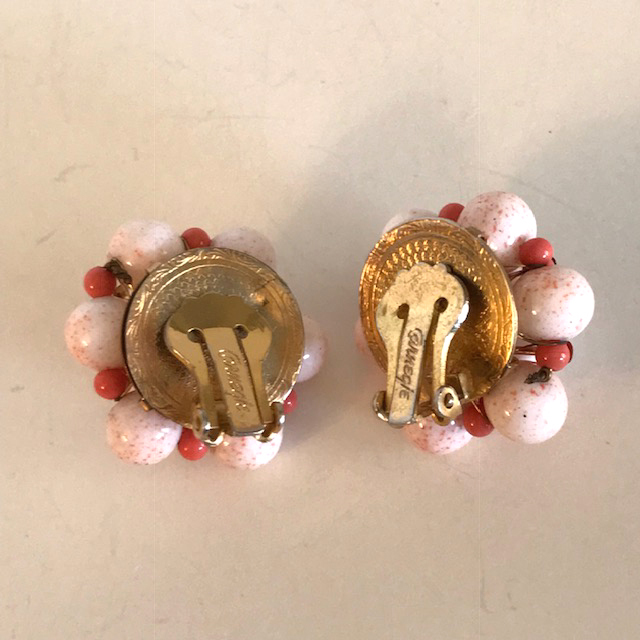 Elegant and innovative, her jewelry remains both wearable and collectible today. 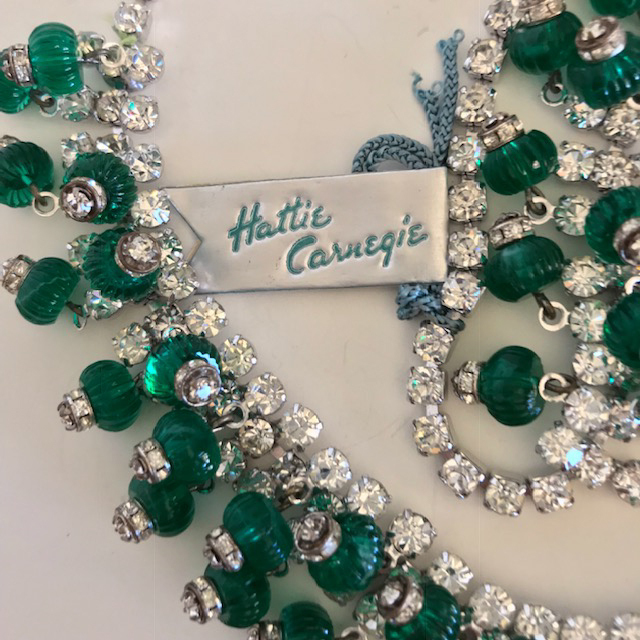 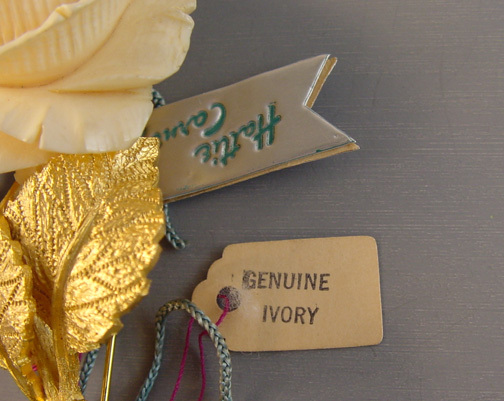 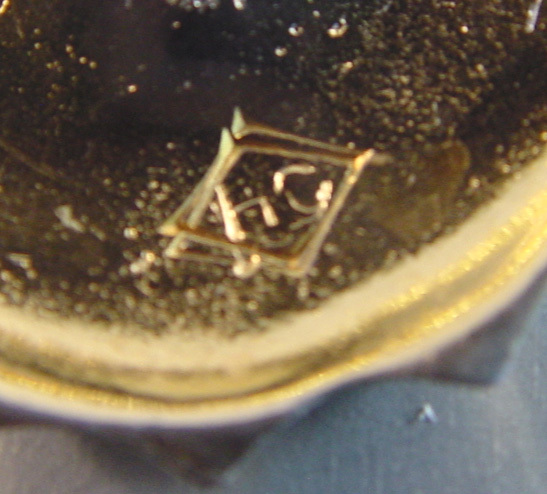 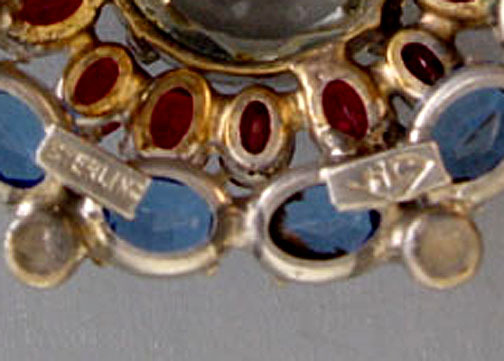 Jewelry under this name was produced for several more years after her death in 1956. 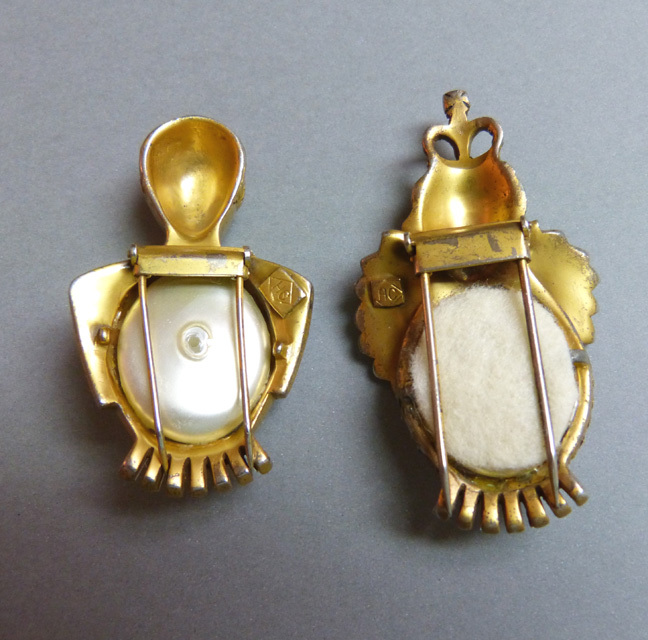 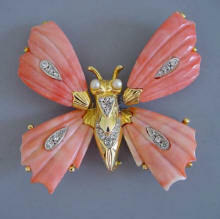 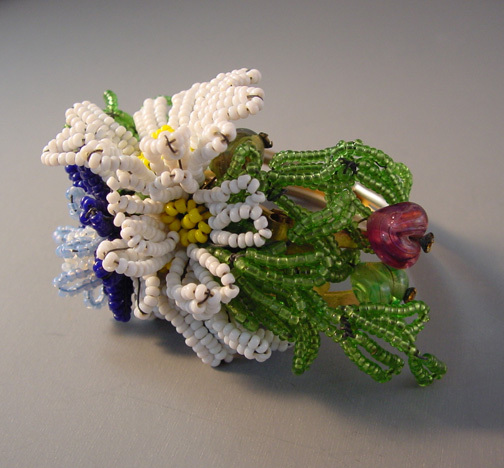 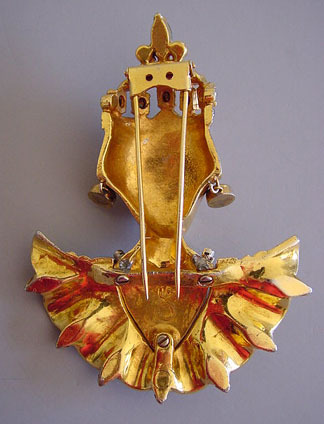 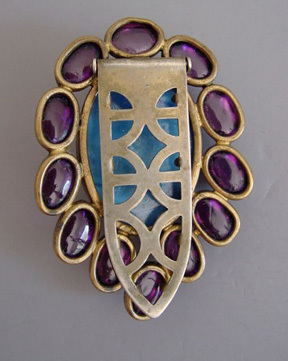 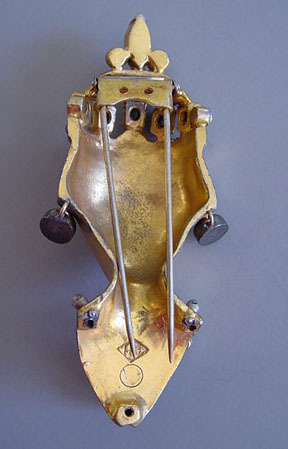 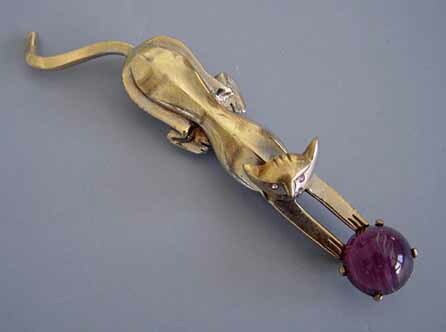 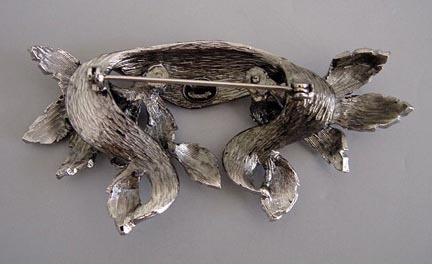 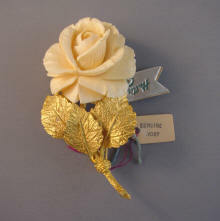 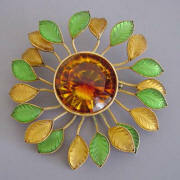 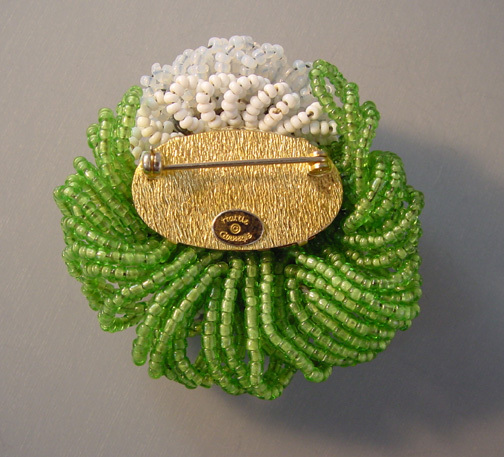 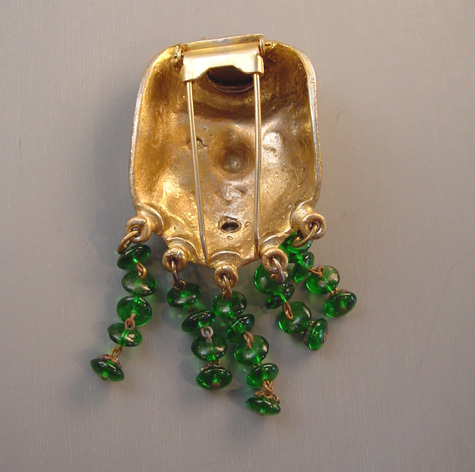 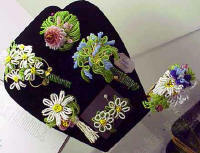 Hattie Carnegie made different versions of this brooch, as you can see here. 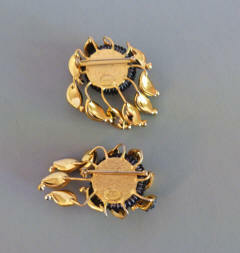 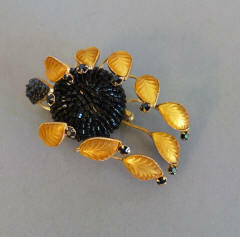 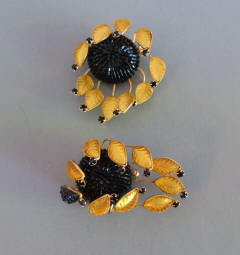 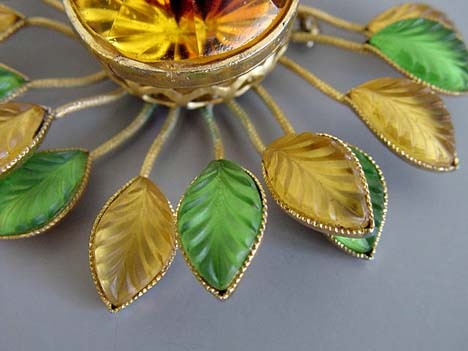 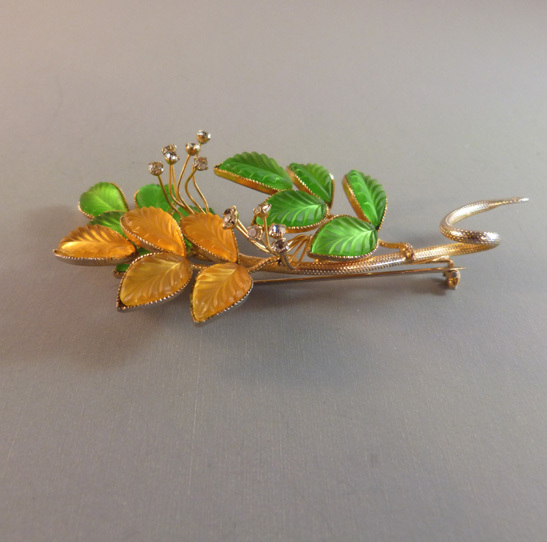 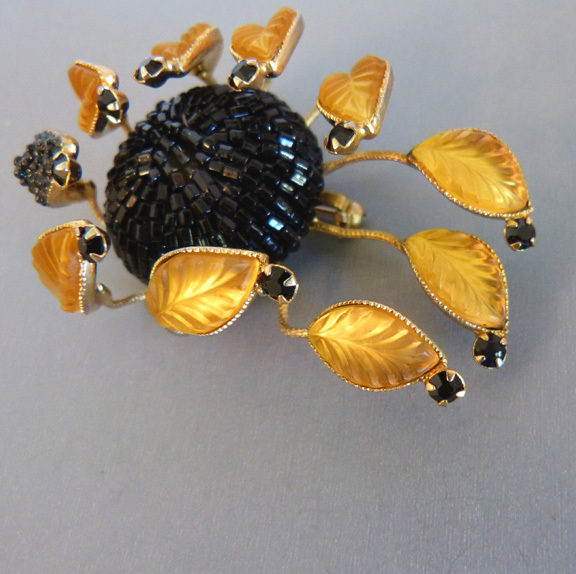 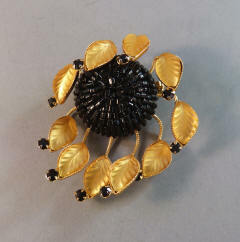 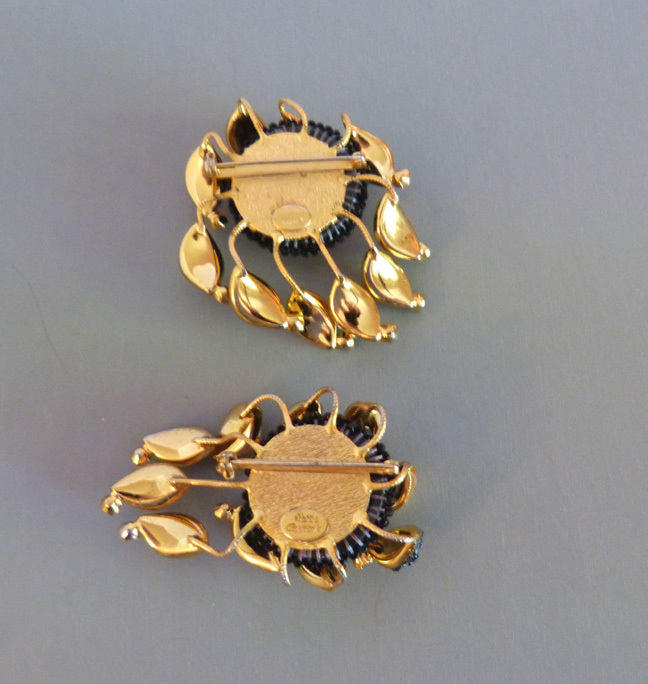 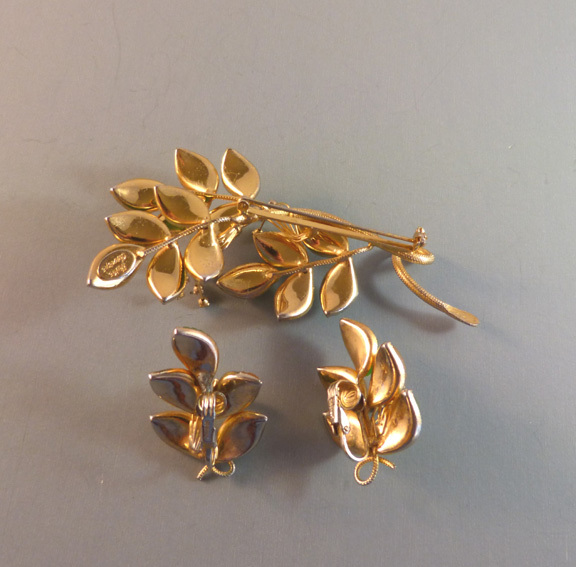 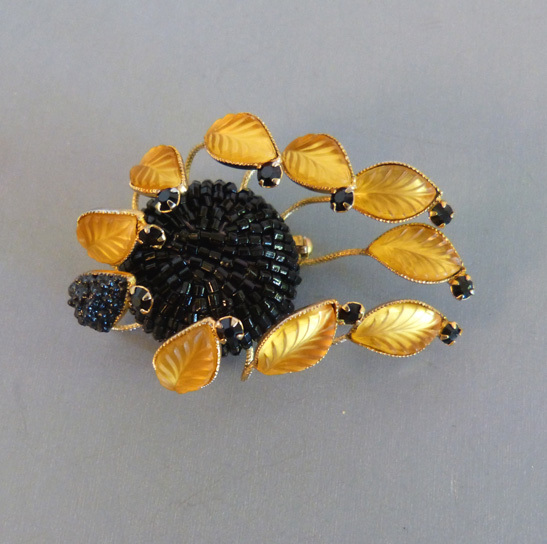 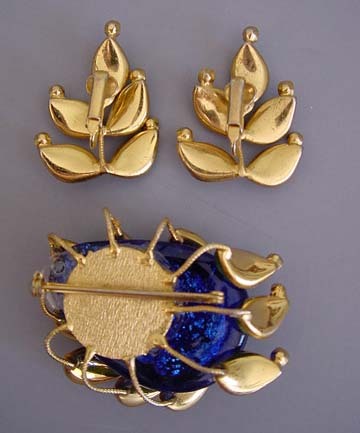 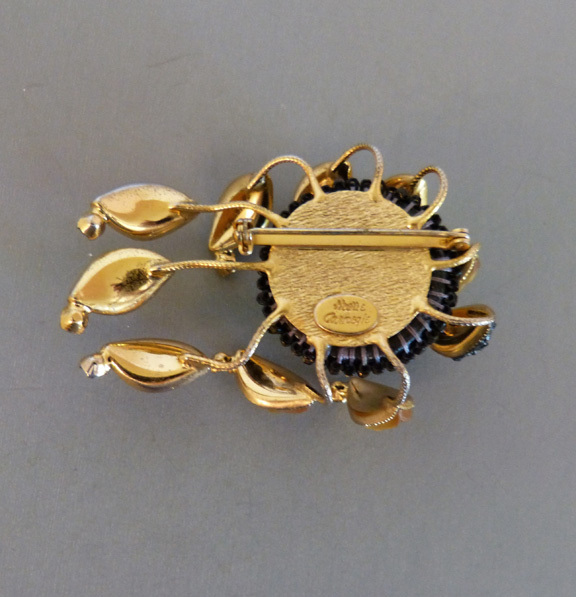 CARNEGIE Hattie Carnegie brooch with frosted golden glass leaves surrounding black glass bugle bead center, all set in gold tone metal, 2-1/3" by 1-3/4". 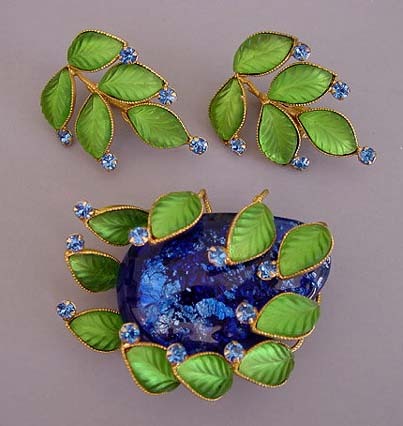 Similar molded glass leaves were also used by Schreiner during this circa 1960 time period, and I have a real fondness for them. 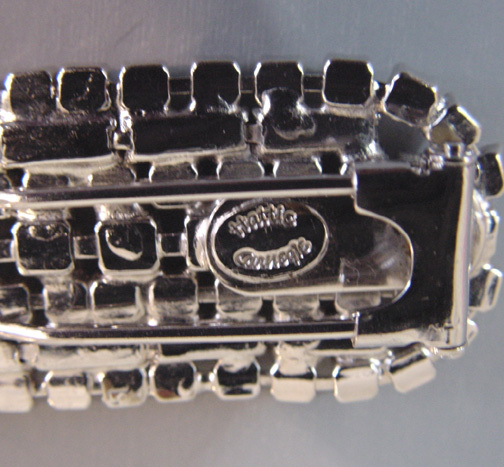 View View View f g h #X39463 And even the backs are not quite the same. 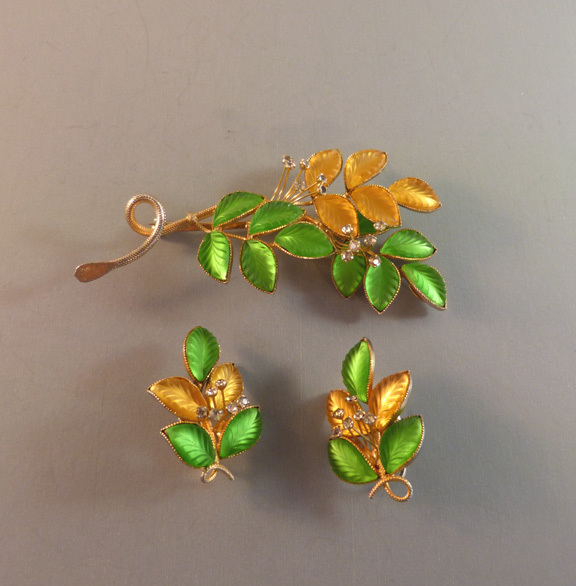 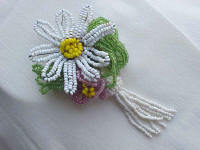 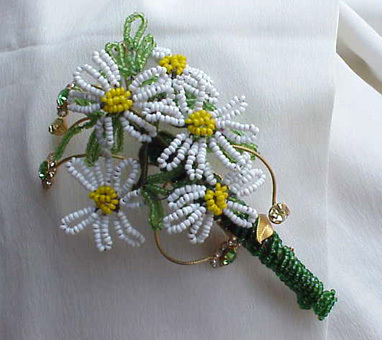 CARNEGIE white, yellow and green daisy 4-1/2" pin and earrings. 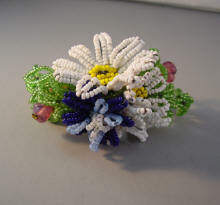 View View View #C10583 CARNEGIE beaded flower bracelet and brooches. 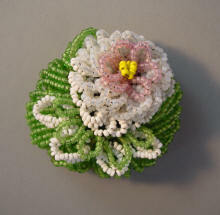 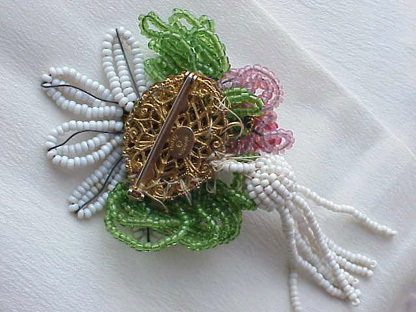 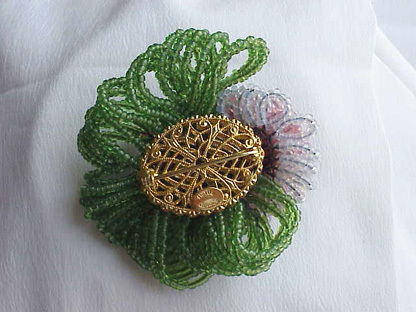 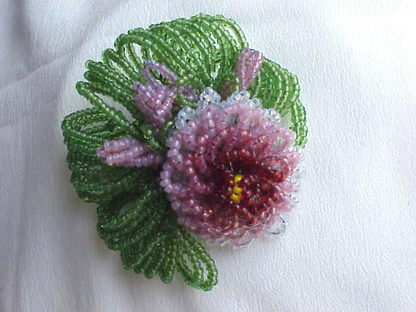 CARNEGIE 2-1/2" three-tone pink and green beaded flower brooch. 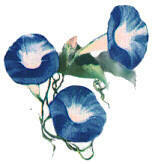 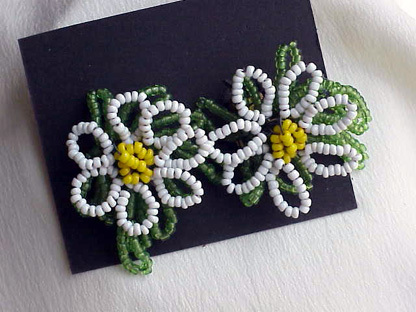 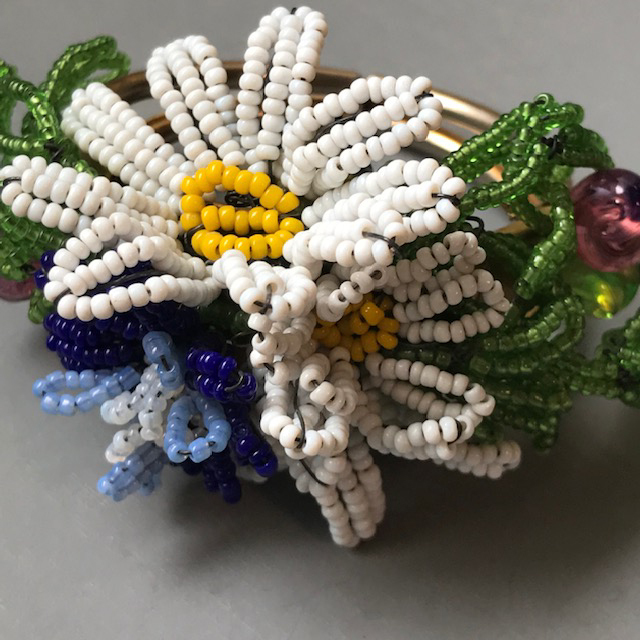 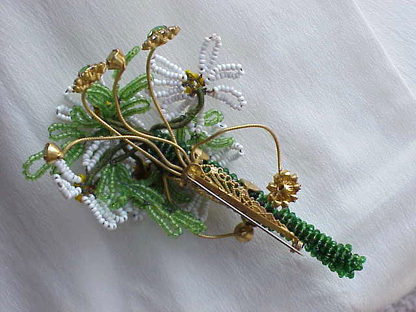 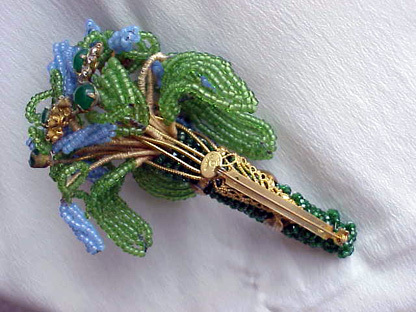 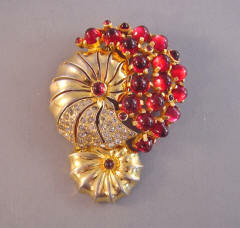 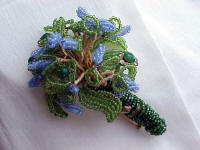 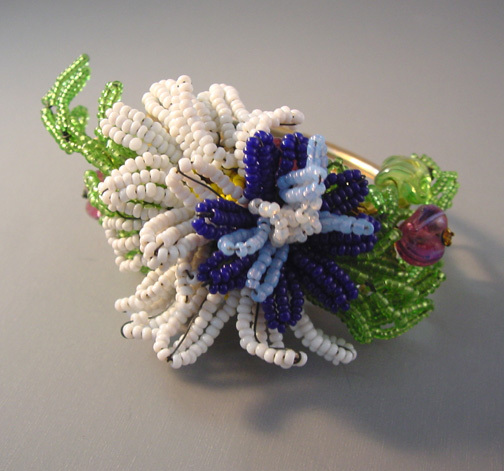 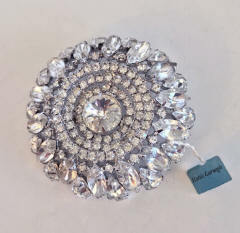 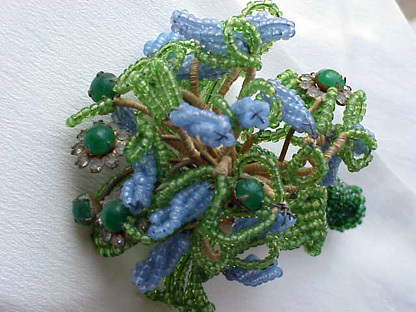 View #C15477 CARNEGIE seed beaded flower brooch, 3-3/4" total length. 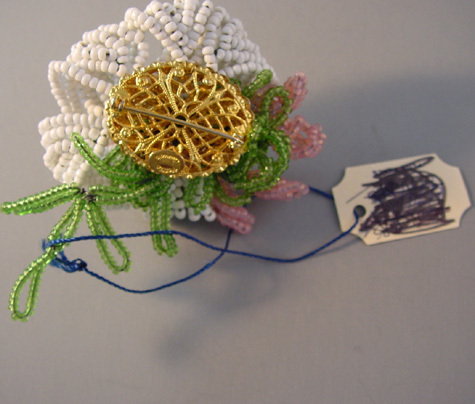 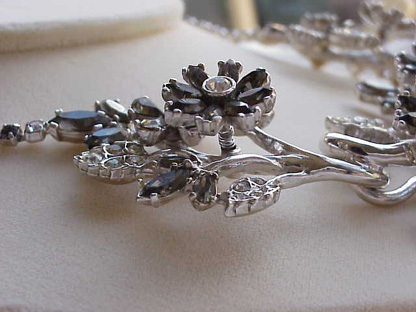 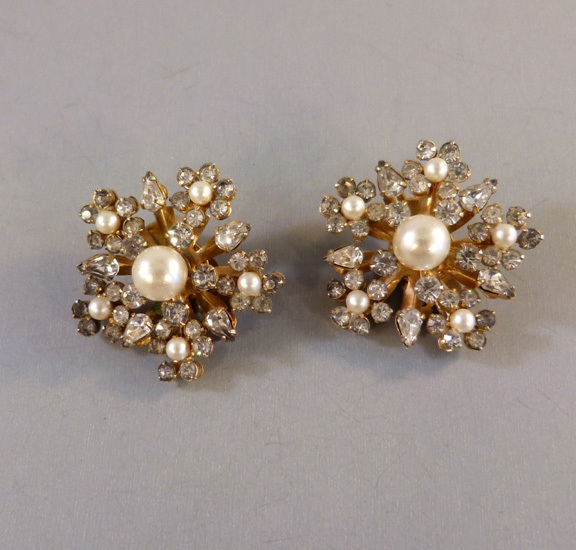 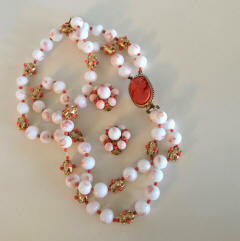 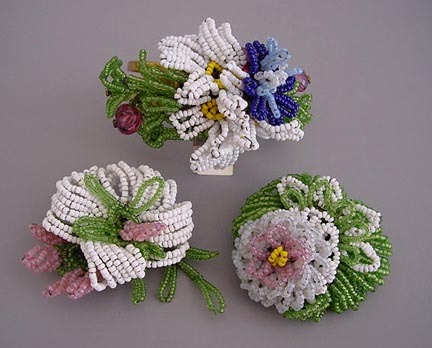 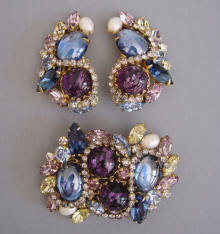 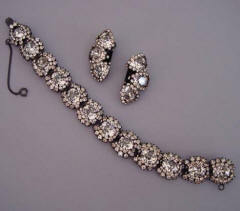 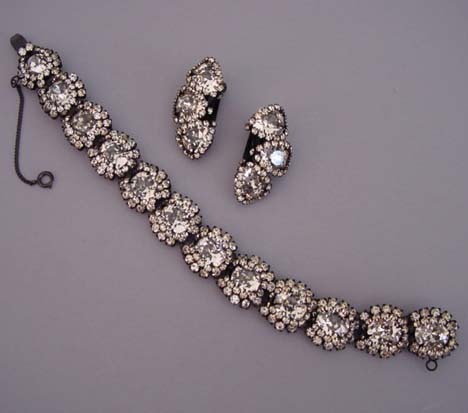 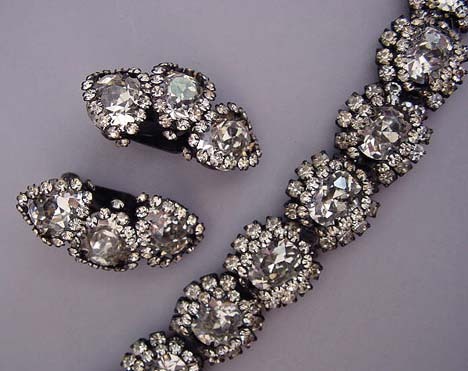 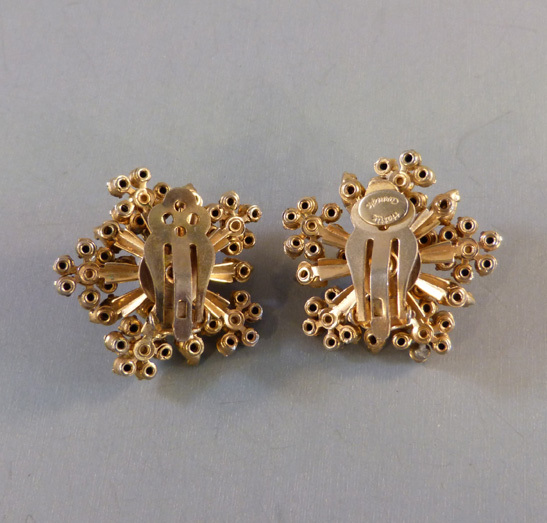 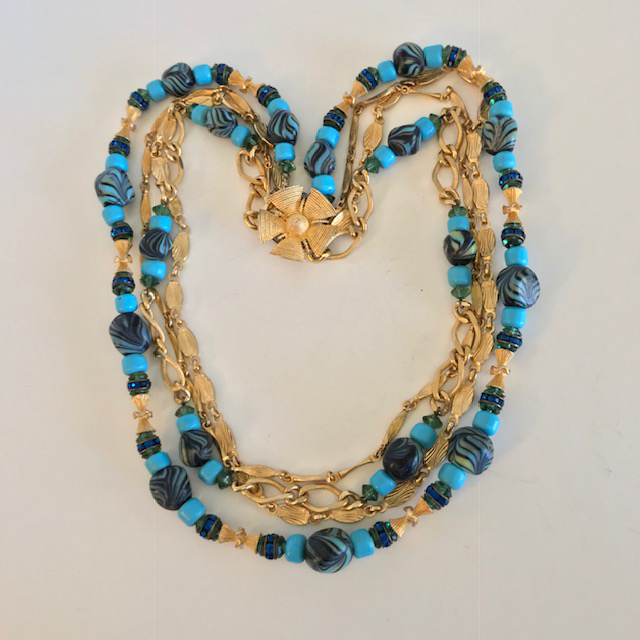 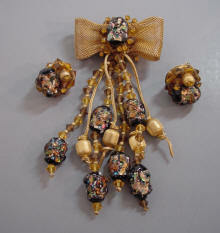 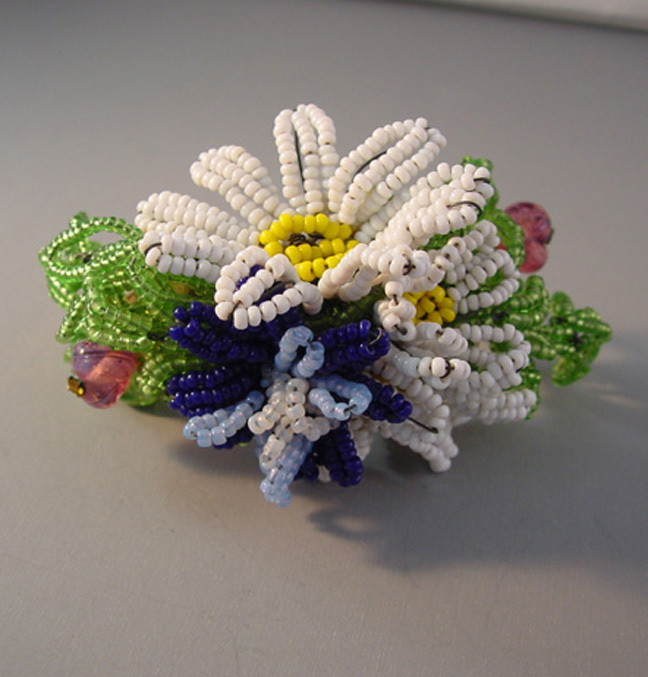 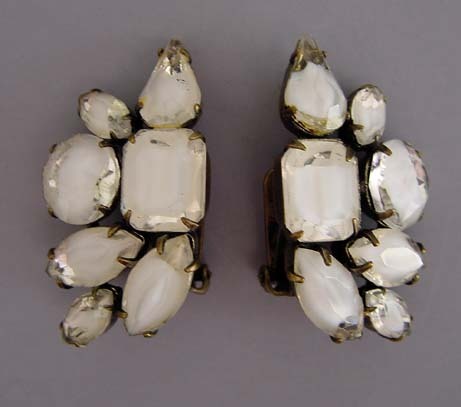 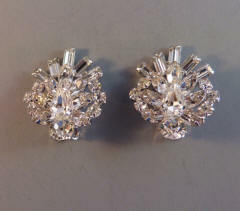 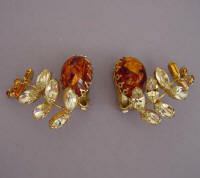 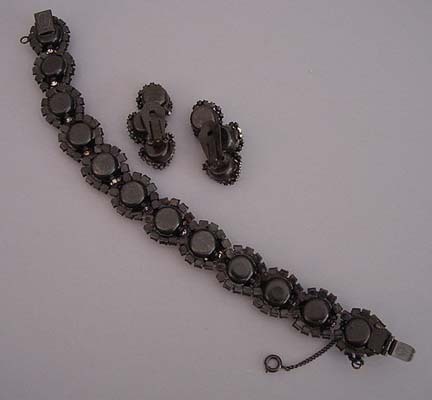 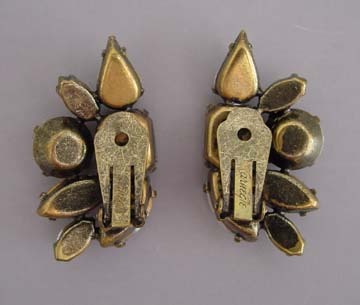 View #C16278 CARNEGIE made some terrific jewelry, and favorites are these beaded flowers. 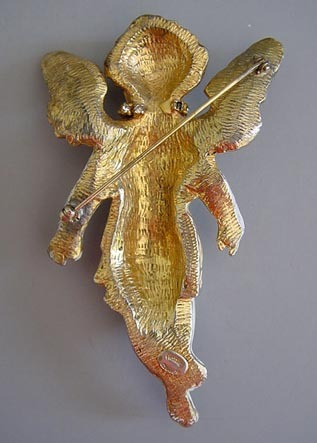 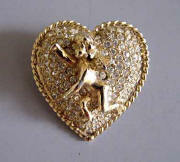 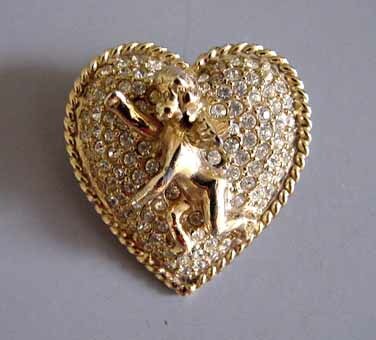 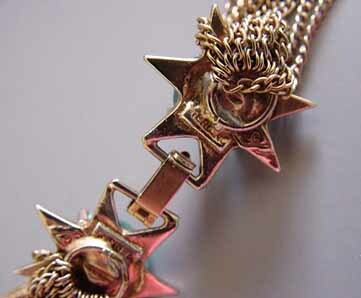 CARNEGIE cupid on pave heart pin, 1-1/3". 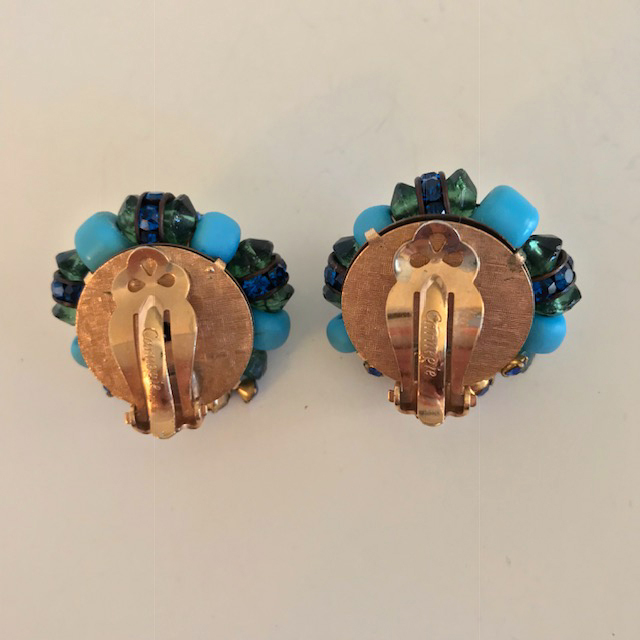 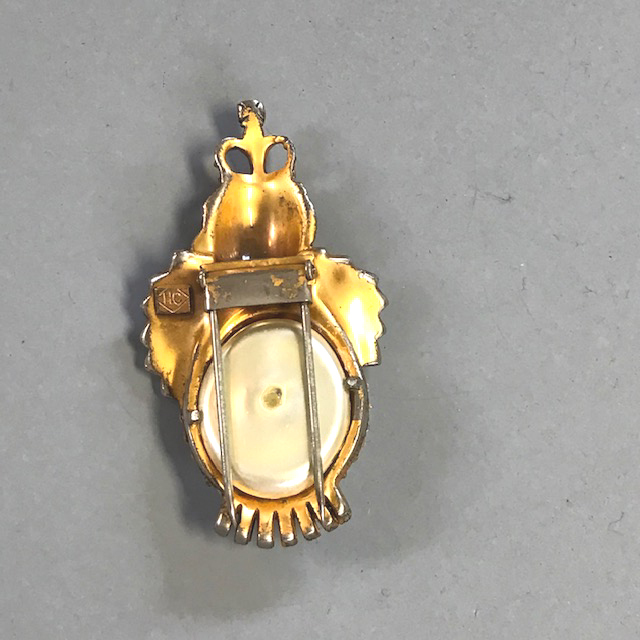 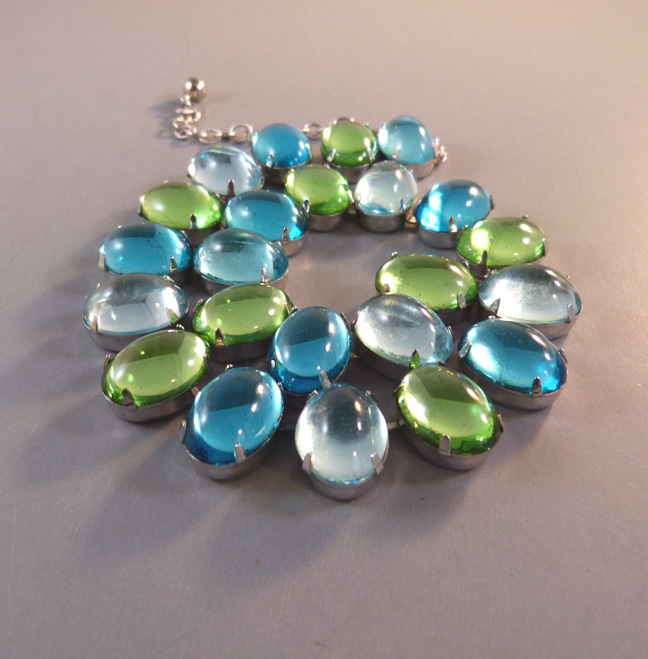 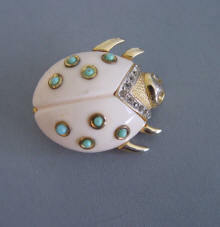 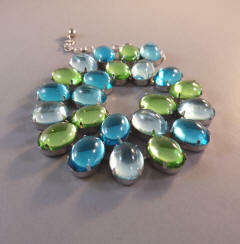 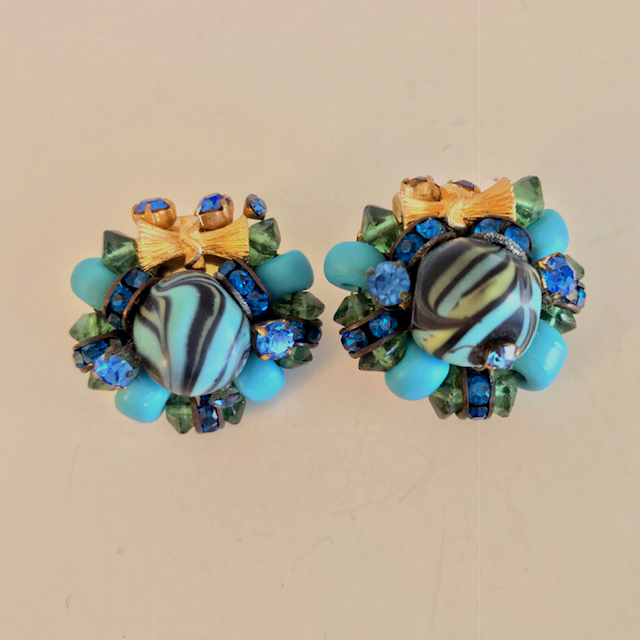 CARNEGIE white enamel and gold tone 2-7/8" pin with aqua cabochons and clear rhinestones. 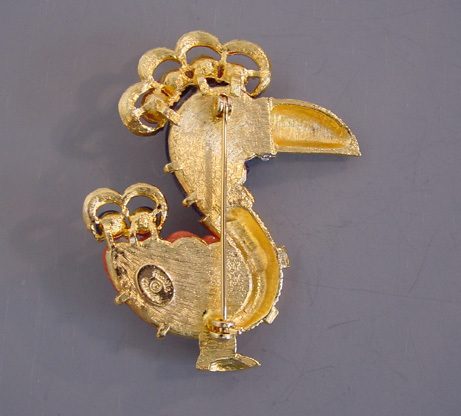 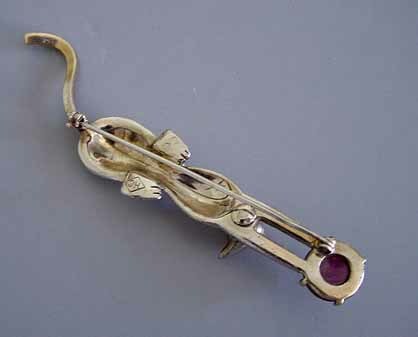 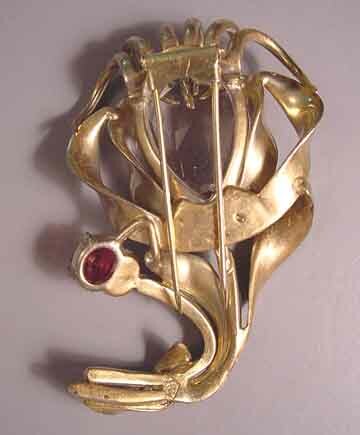 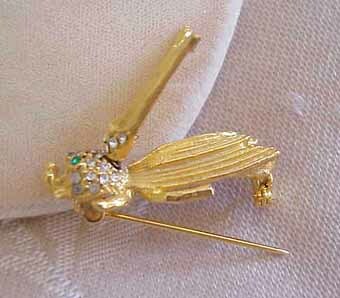 UNSIGNED NOTE: This unsigned mermaid brooch is often attributed to Hattie Carnegie, but so far, we have never seen a single signed version of it. 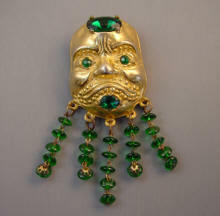 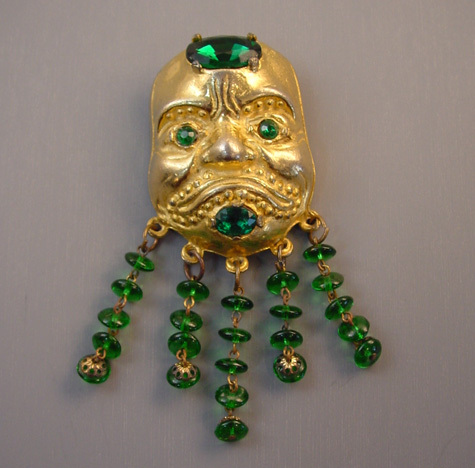 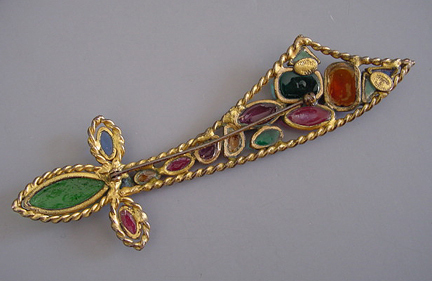 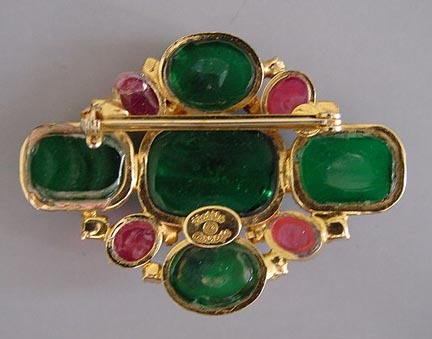 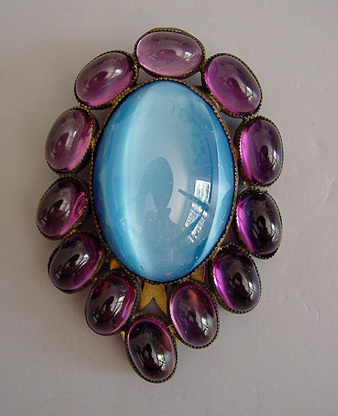 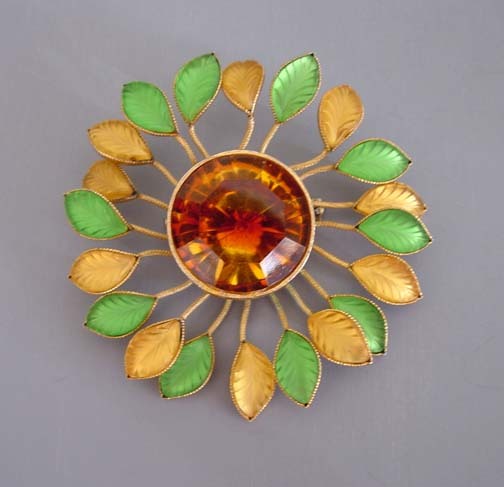 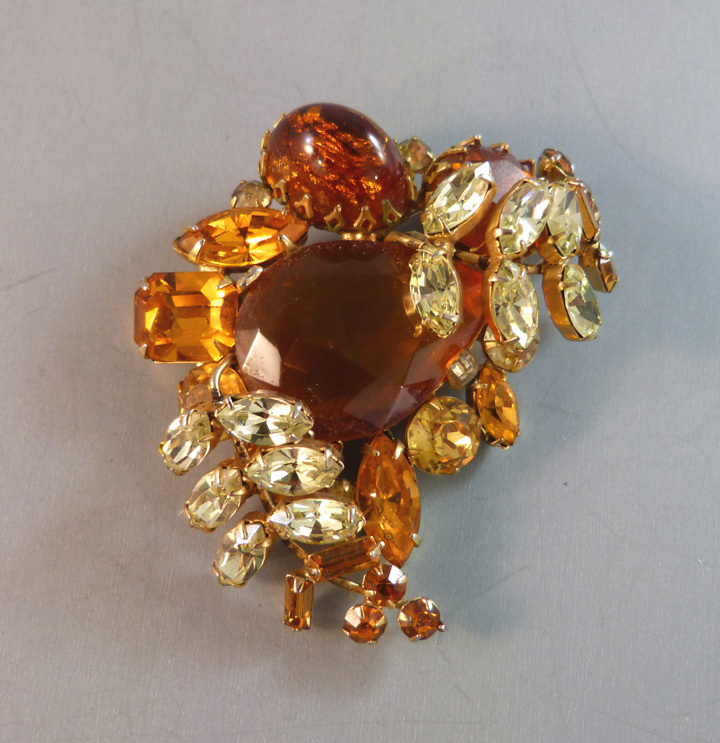 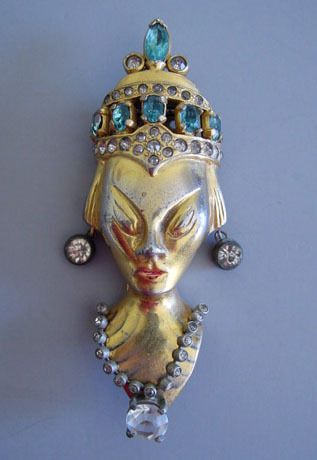 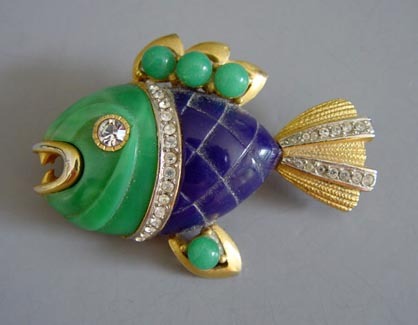 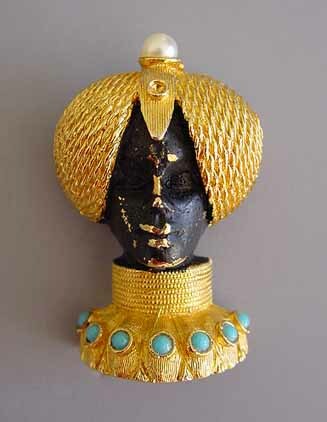 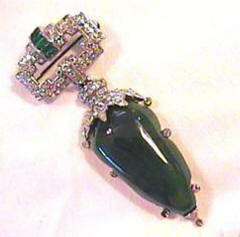 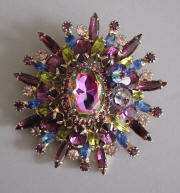 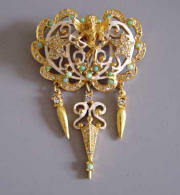 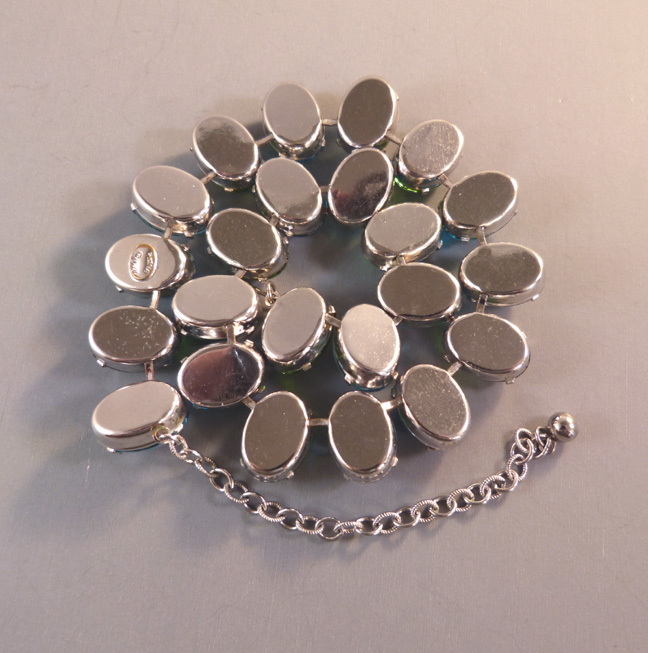 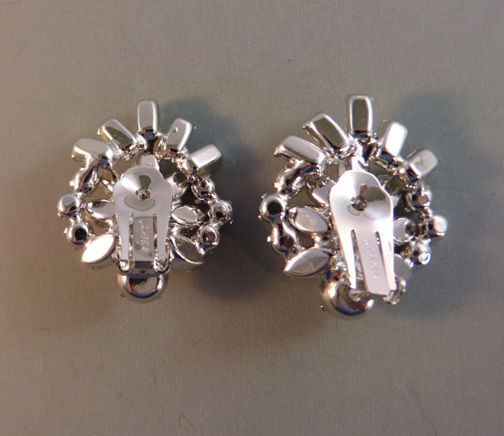 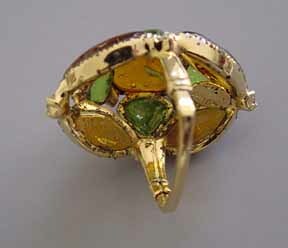 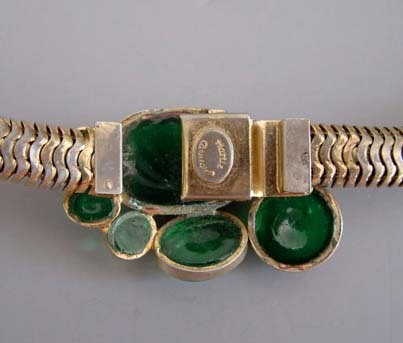 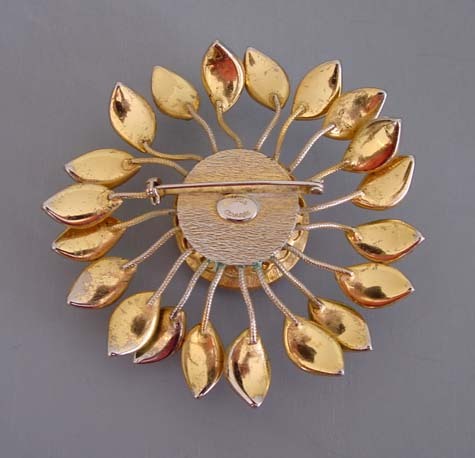 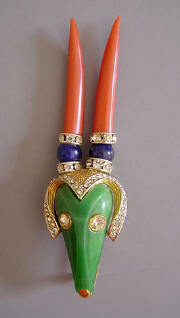 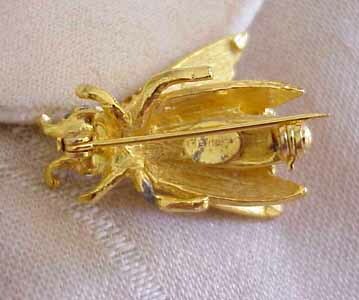 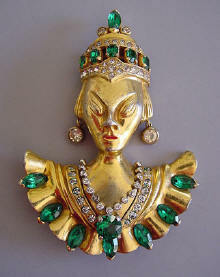 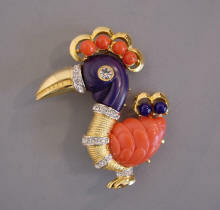 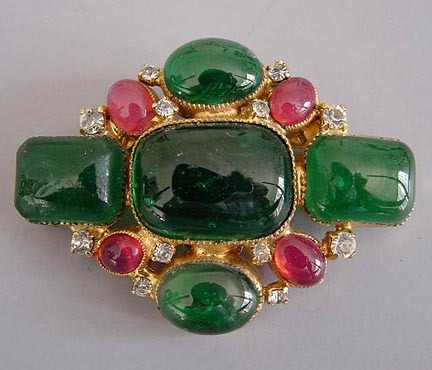 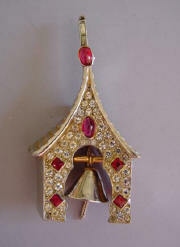 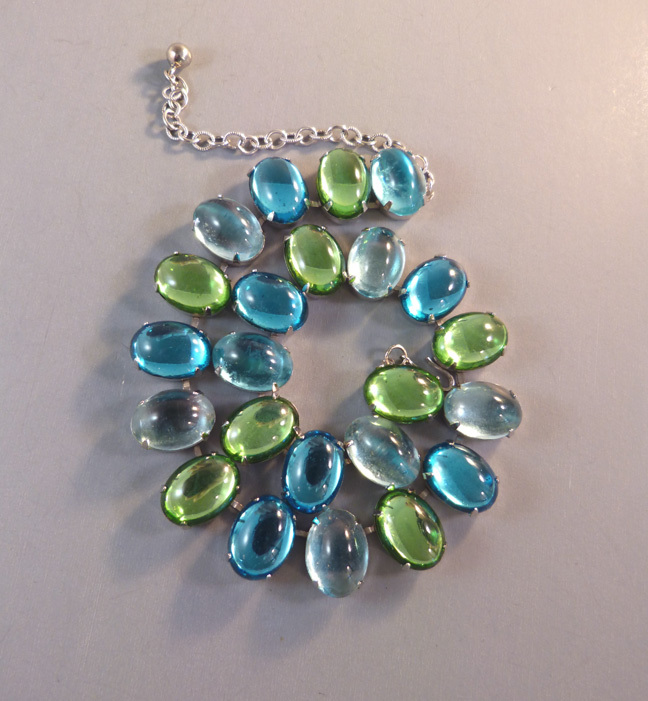 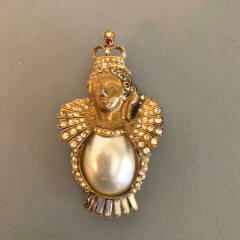 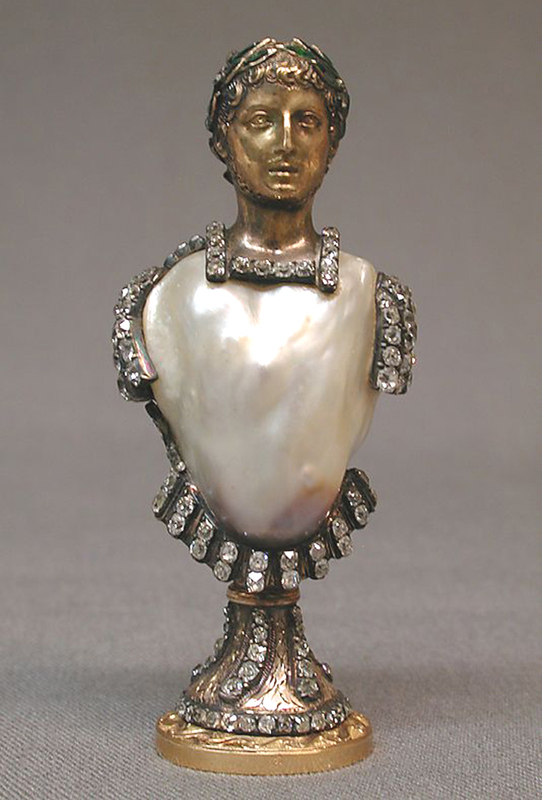 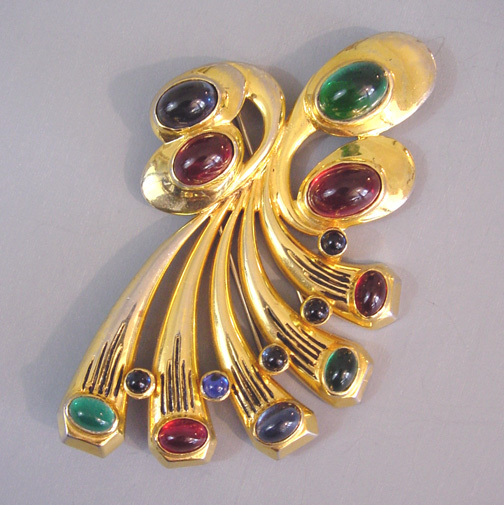 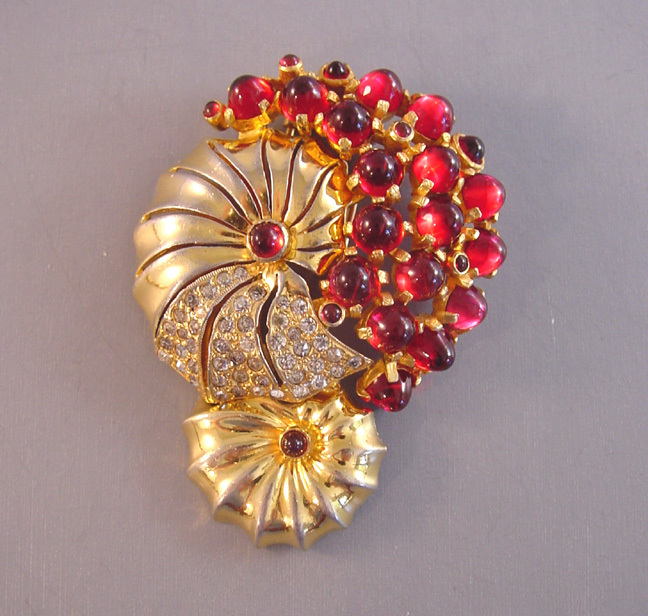 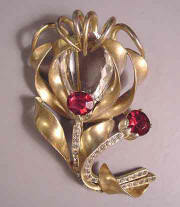 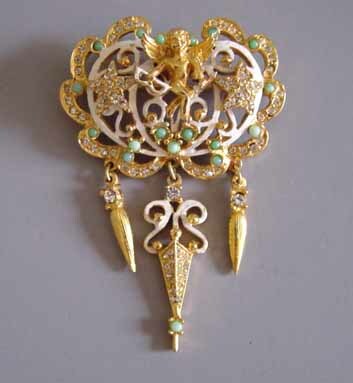 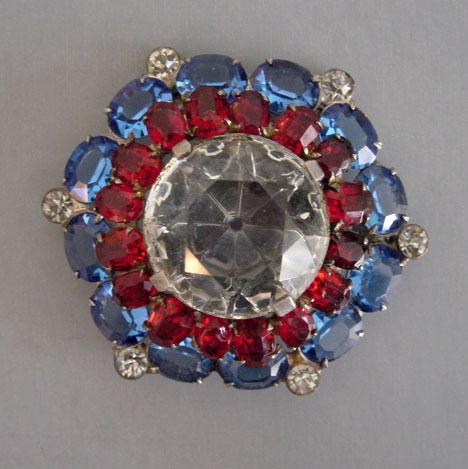 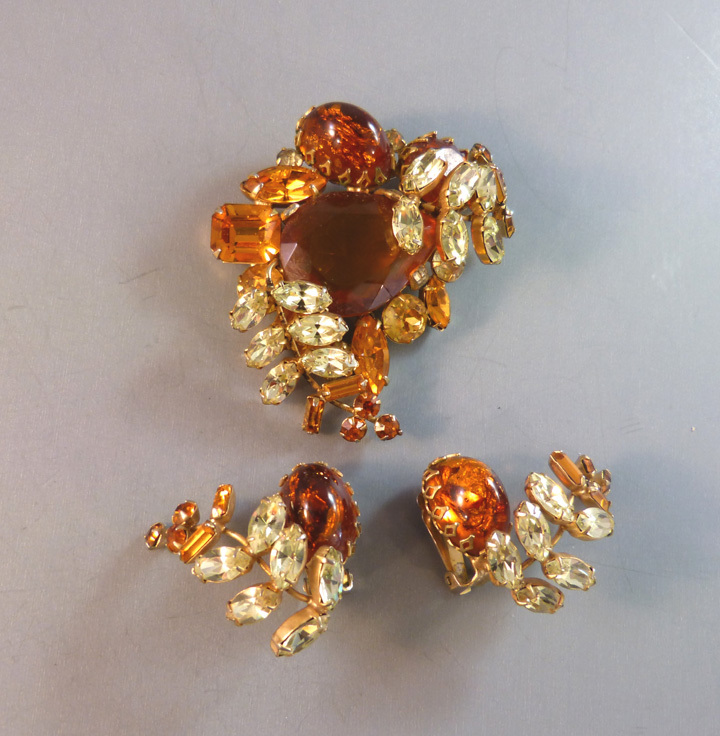 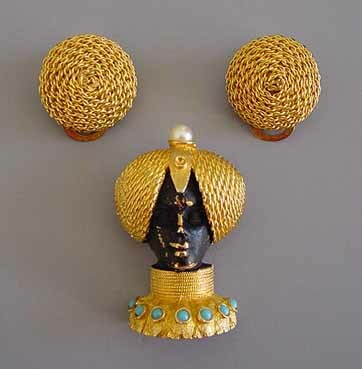 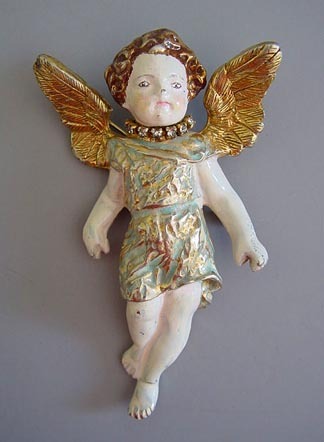 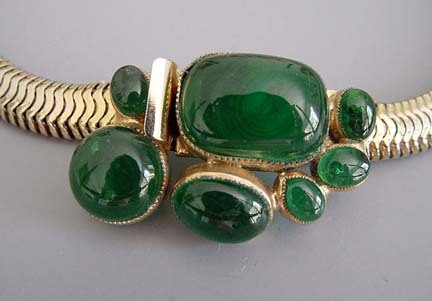 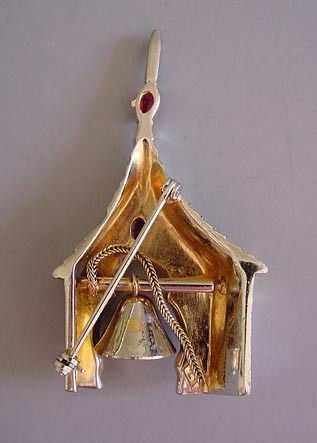 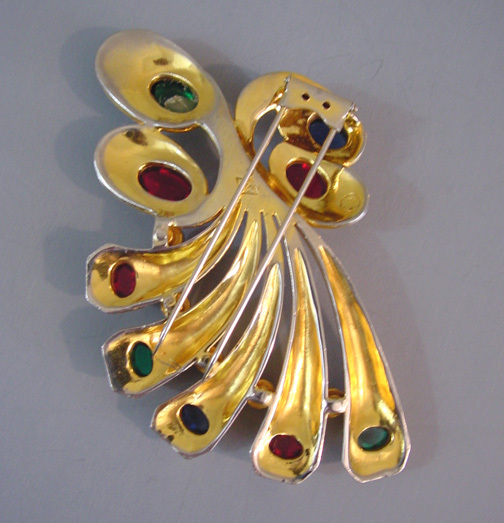 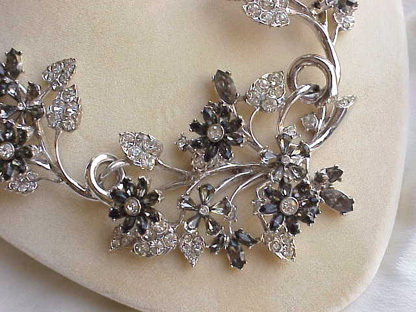 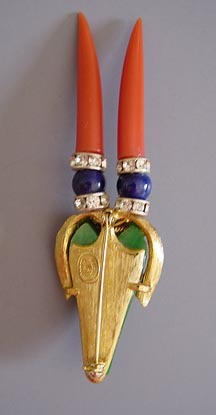 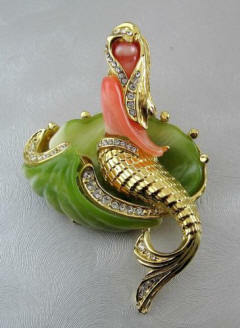 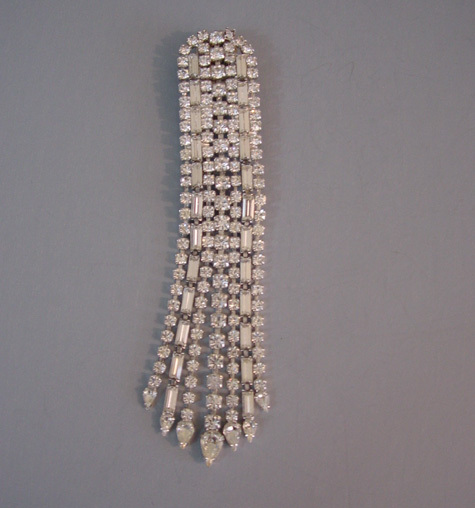 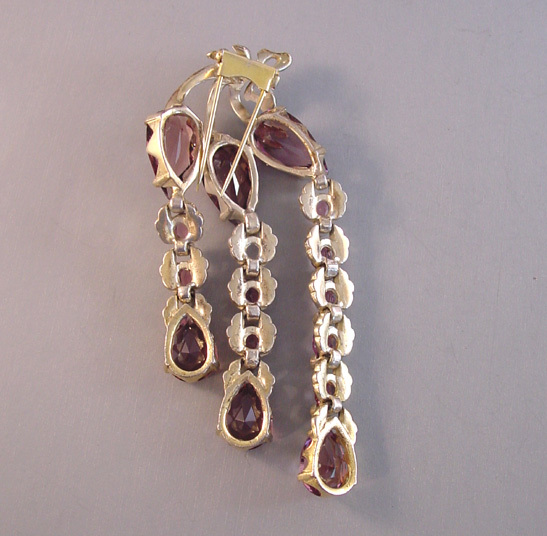 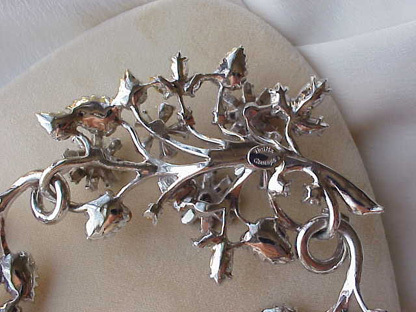 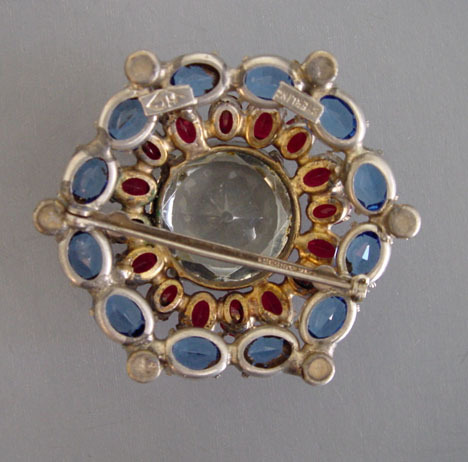 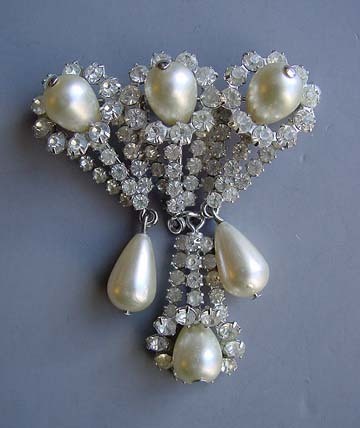 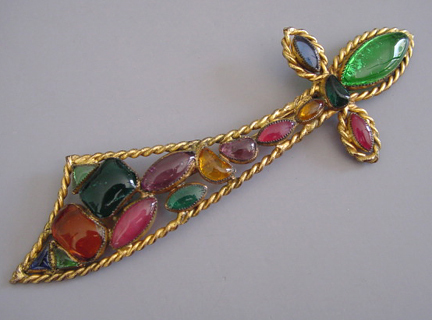 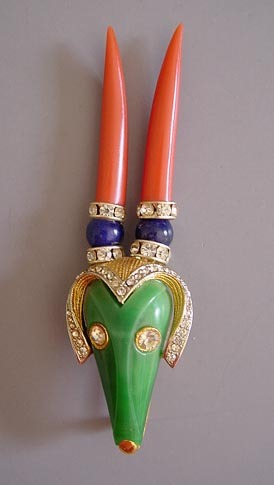 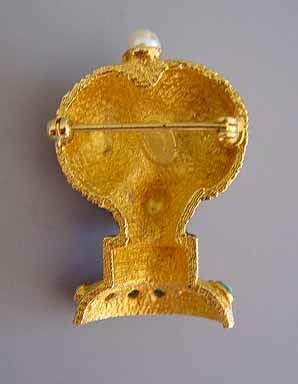 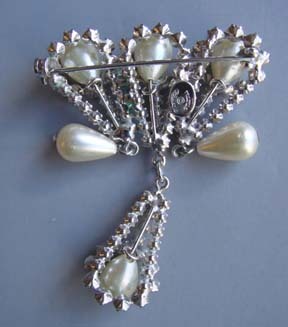 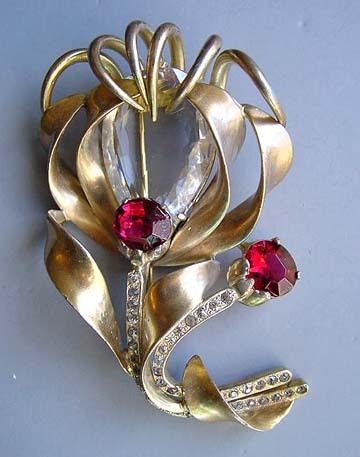 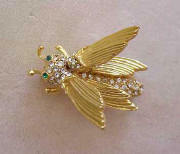 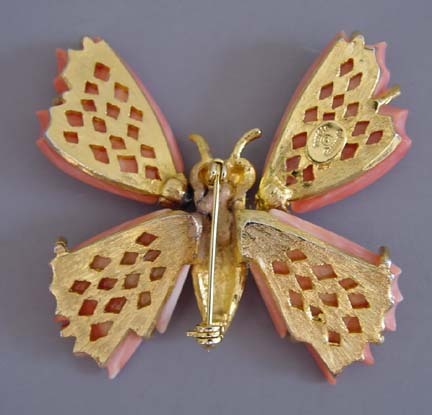 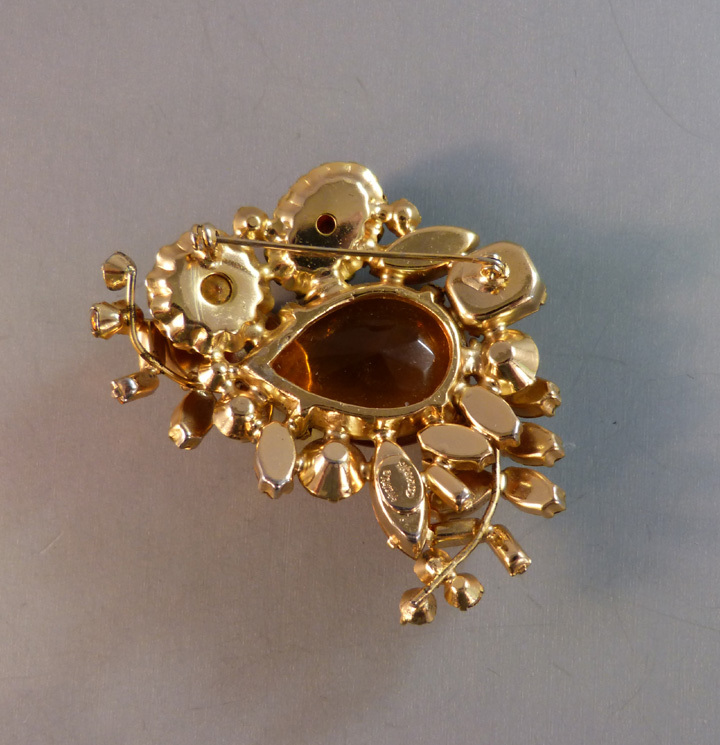 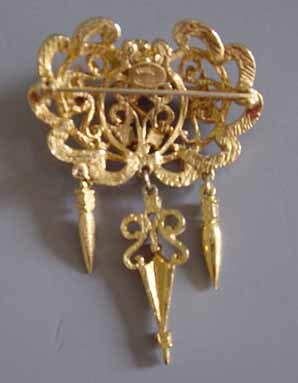 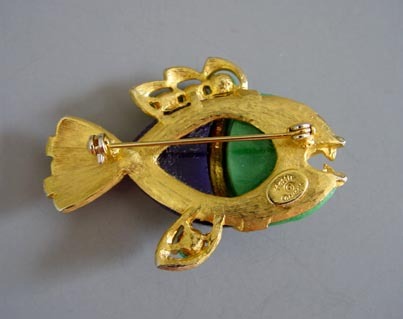 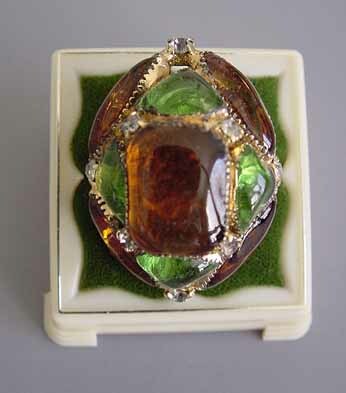 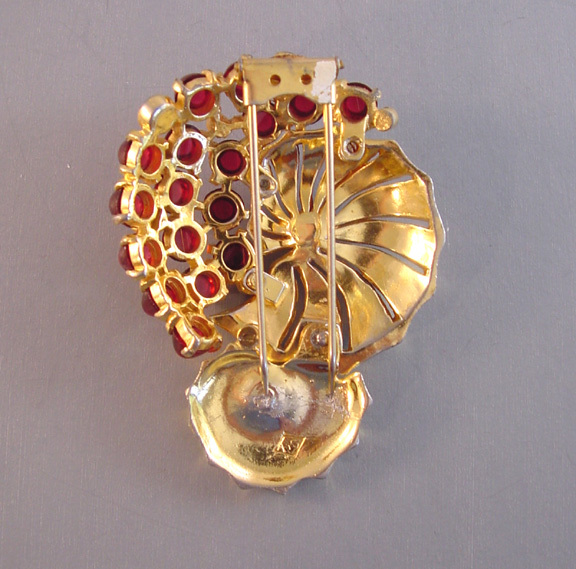 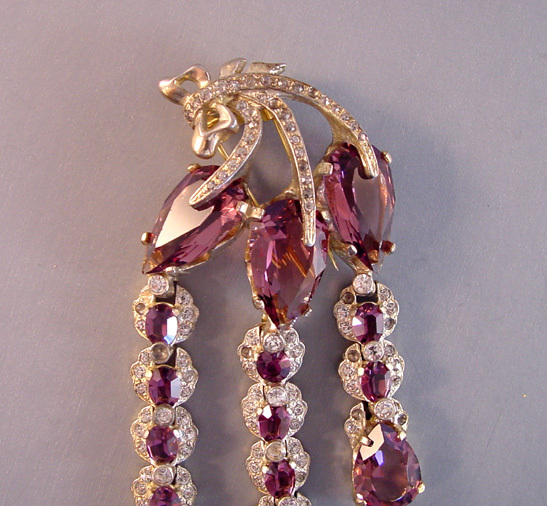 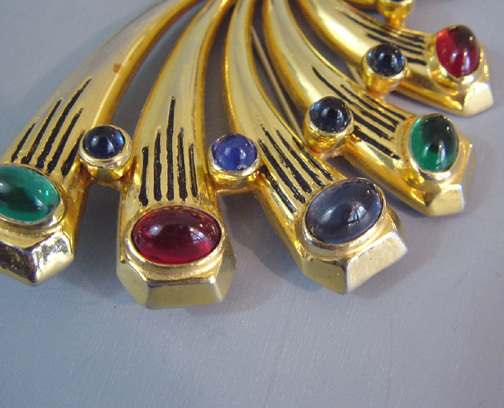 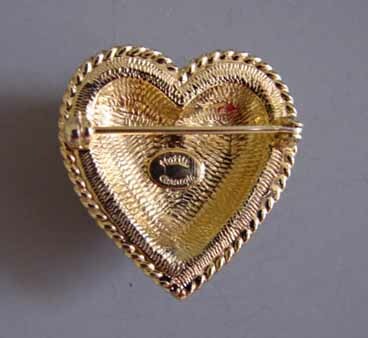 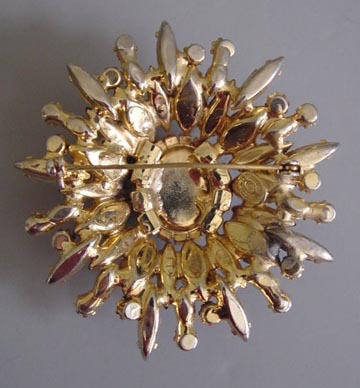 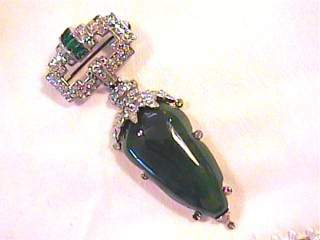 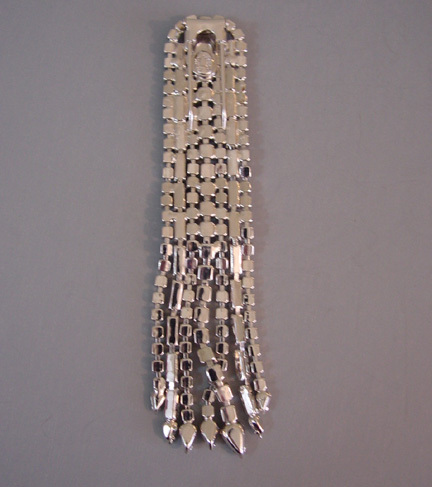 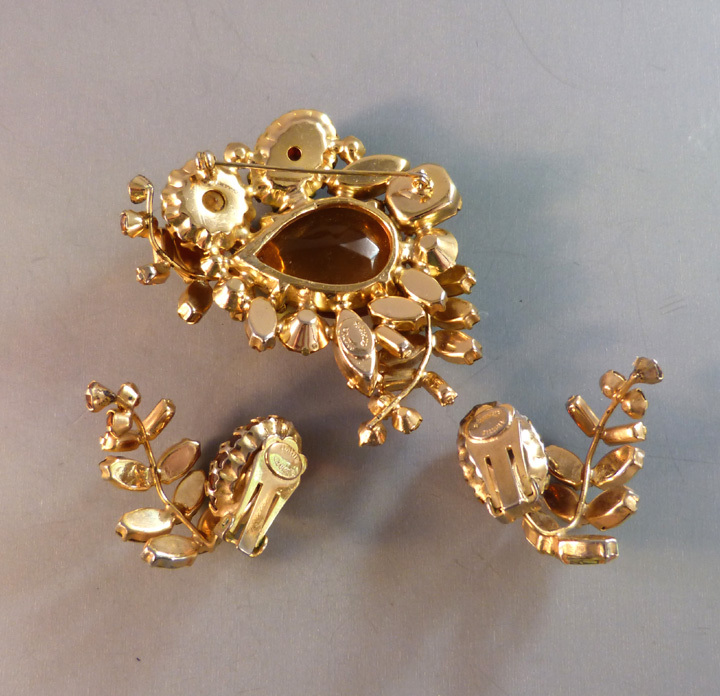 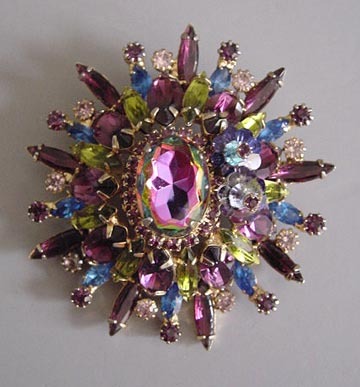 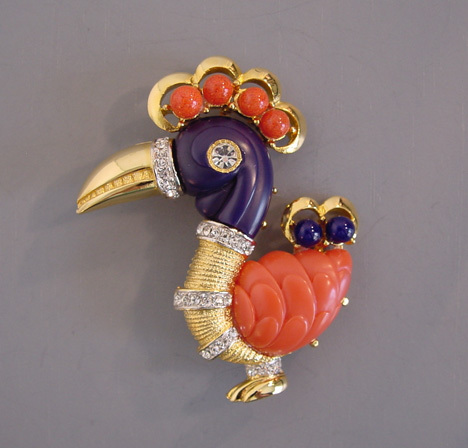 This brooch WAS seen by us back in the late 1990s. 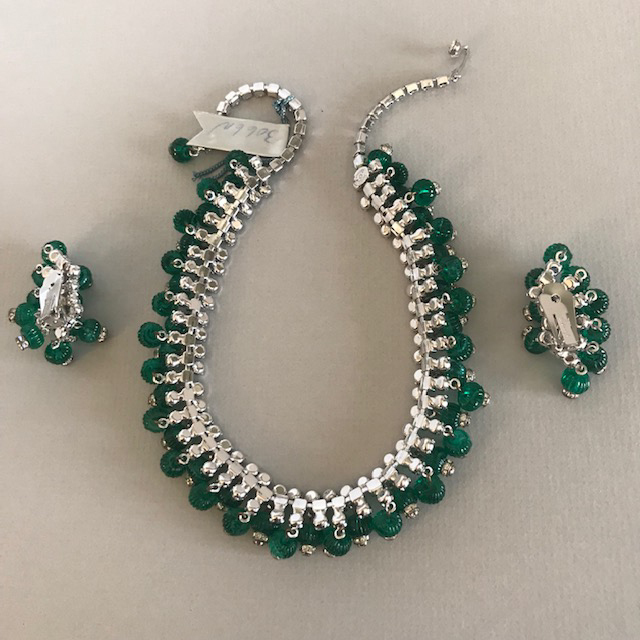 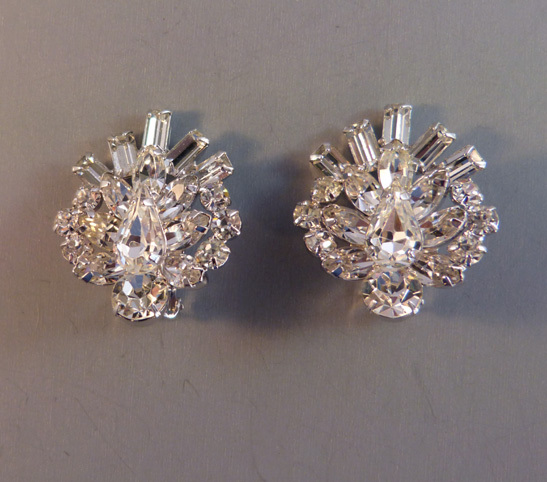 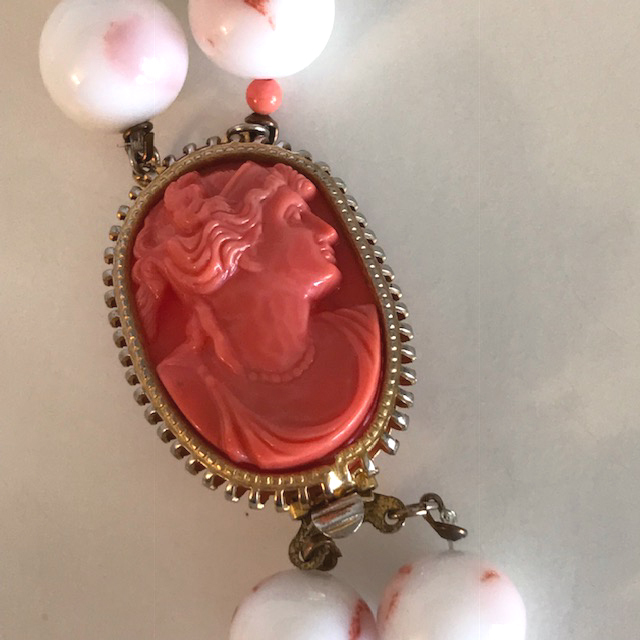 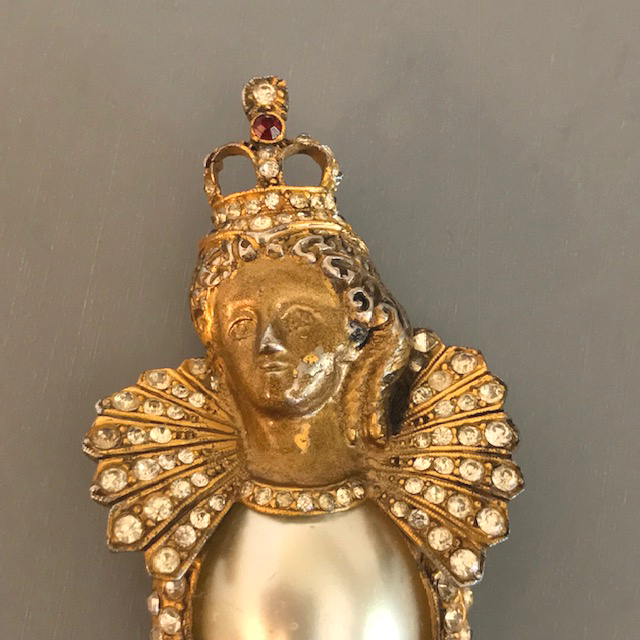 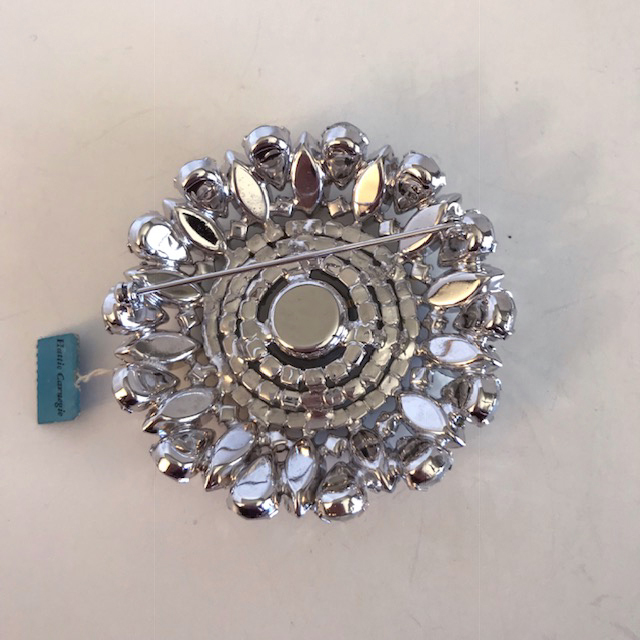 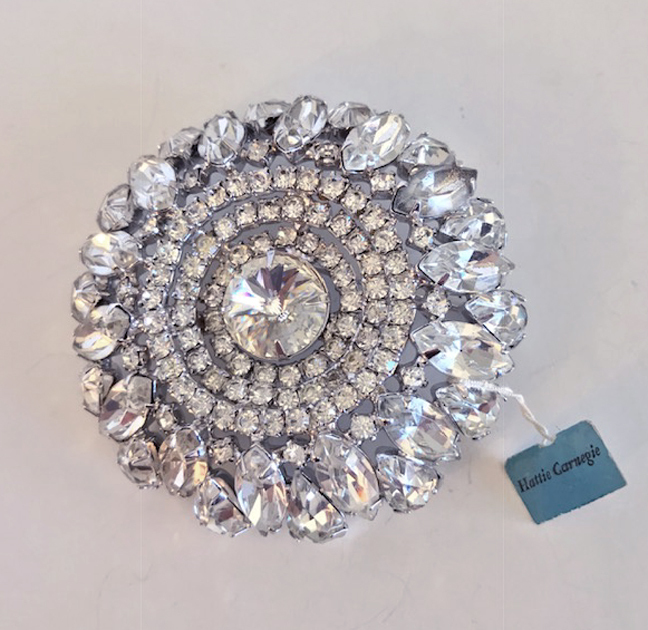 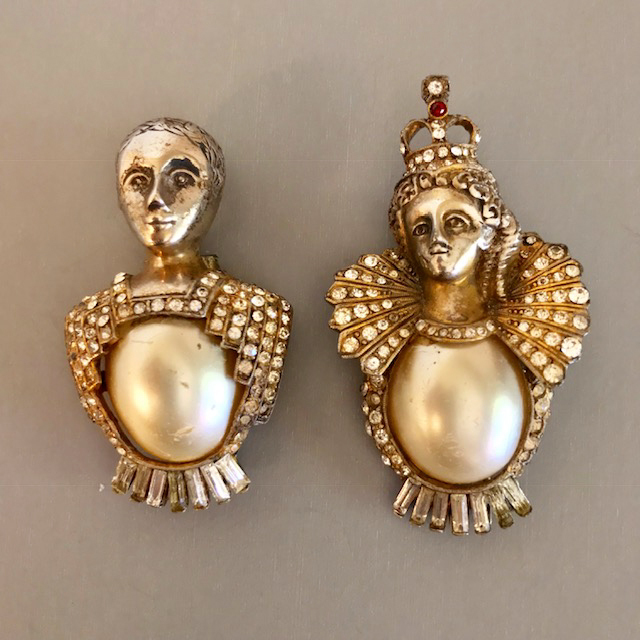 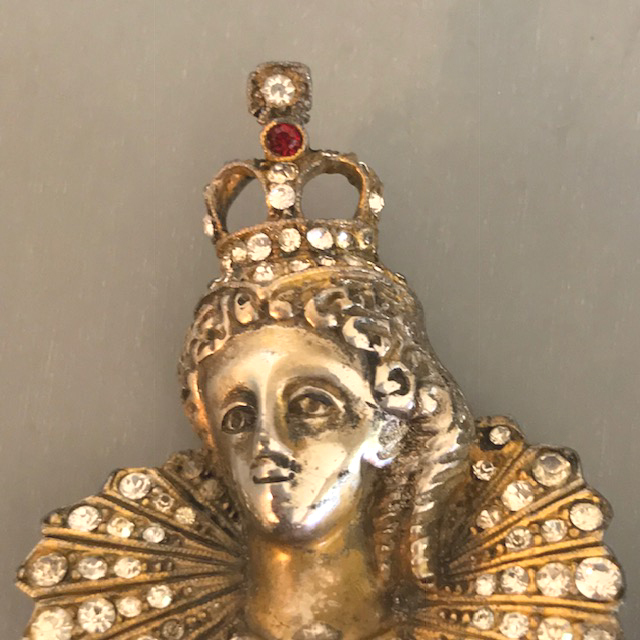 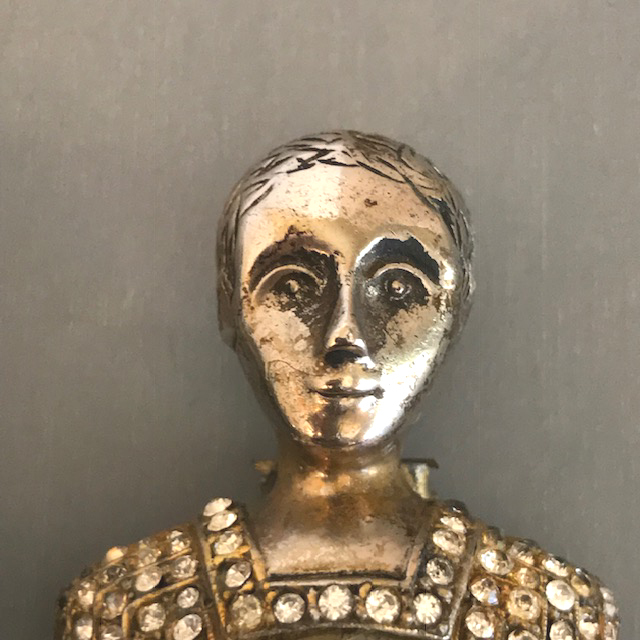 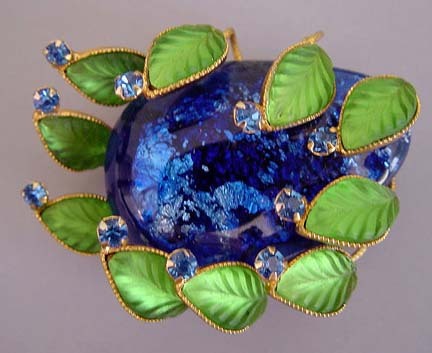 It was being offered for sale at the Las Vegas Jewelry Show and sold by a Chinese company who made jewelry reproductions, including a few unsigned "Swarovski" looking brooches. There may be a signed version of this mermaid, and if so, we would like to see it. 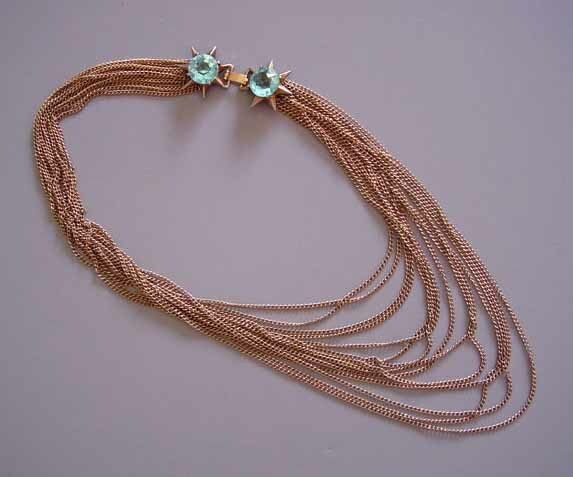 So far, I see no evidance that it is by Carnegie at all.